Gato Class Submarine: Laid down, 1 March 1941, at the Electric Boat Co., Groton, CT.; Launched, 22 December 1941; Commissioned USS Grunion (SS-216), 11 April 1942; Final Disposition, last report 30 July 1942, reported overdue from patrol off Kiska Island, Alaska, 5 October 1942, all hands assumed lost; Struck from the Naval Register, 2 November 1942. 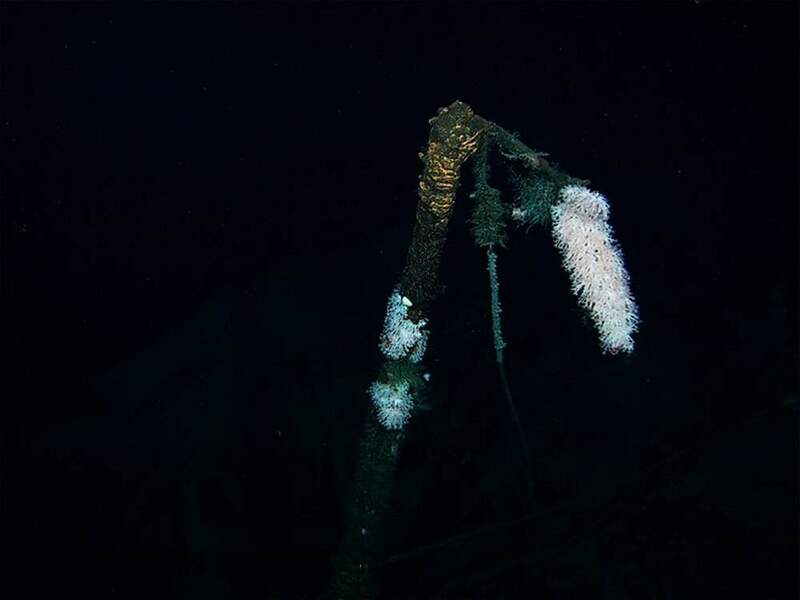 Wreck found in July 2007, in the Segula Canyon, approximatley 1 mile deep off Kiska & Segula Islands in the Aleutian Islands chain. Specifications: Displacement, Surfaced: 1,526 t., Submerged: 2,424 t.; Length 311' 9"; Beam 27' 3"; Draft 15' 3"; Speed, Surfaced 20.25 kts, Submerged 8.75 kts; Complement 6 Officers 54 Enlisted; Operating Depth, 300 ft; Submerged Endurance, 48 hrs at 2 kts; Patrol Endurance 75 days; Cruising Range, 11,000 miles surfaced at 10 kts; Armament, ten 21" torpedo tubes, six forward, four aft, 24 torpedoes, one 3"/50 deck gun, two .50 cal. machine guns, two .30 cal. machine guns; Propulsion, diesel electric reduction gear with four General Motors main generator engines, HP 5400, Fuel Capacity, 97,140 gals., four General Electric main motors, HP 2740, two 126-cell main storage batteries, twin propellers. 247k 10:00 AM is keel laying time at the Electric Boat Co., Groton, CT. 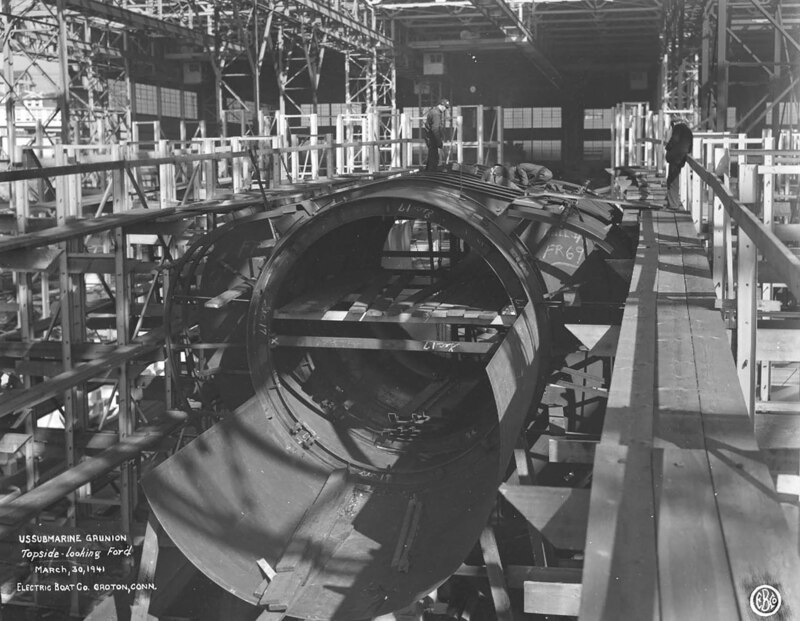 The Grunion's (SS-216) keel is laid down on 1 March 1941. Electric Boat photo # BS 31052 via NARA College Park, courtesy of Tracy White @ Researcher @ Large. 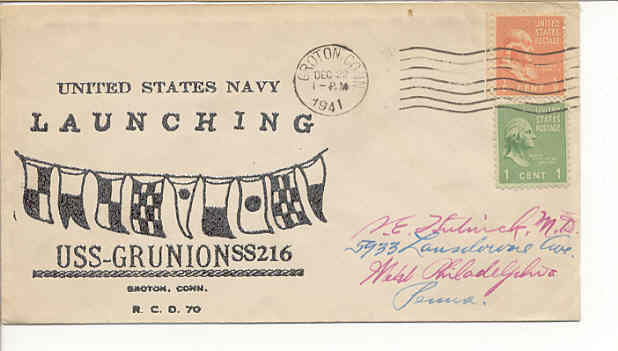 16k Commemorative postal cover marking the keel laying of the Grunion (SS-216) at the Electric Boat Co., Groton, CT., 1 March 1941. Courtesy of Jack Treutle (of blessed memory). 285k Topside looking forward at the Grunion (SS-216), 30 March 1941. Electric Boat photo # BS 31054 via NARA College Park, courtesy of Tracy White @ Researcher @ Large. 319k Bow view of the Grunion (SS-216) looking aft on 9 July 1941. Electric Boat photo # BS 31056 via NARA College Park, courtesy of Tracy White @ Researcher @ Large. 401k Growler (SS-215), bow view looking aft, 9 July 1941. 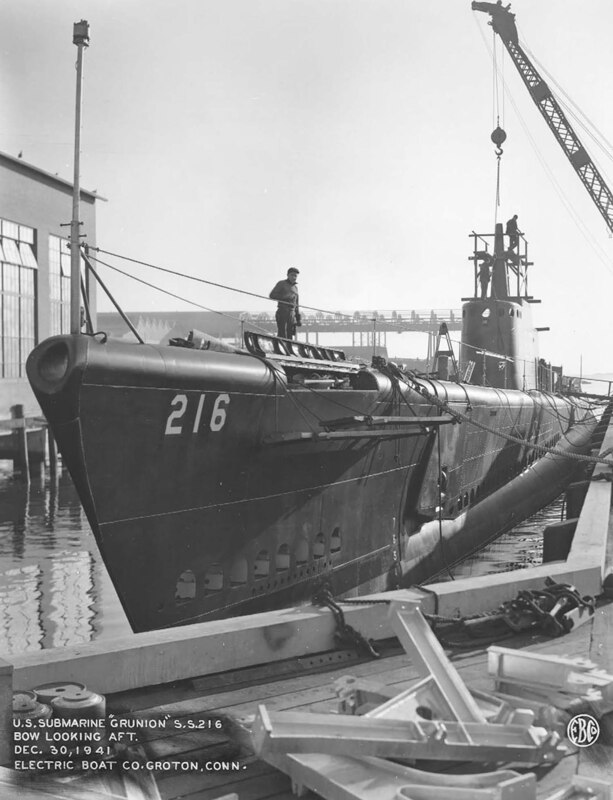 The boat being built next to her is the Grunion (SS-216), there were only 18 days separating their building. Electric Boat photo # BS 31125 via NARA College Park, courtesy of Tracy White @ Researcher @ Large. 283k Bow view of the Grunion (SS-216) looking aft on 30 September 1941. Electric Boat photo # BS 31057 via NARA College Park, courtesy of Tracy White @ Researcher @ Large. 57k The Grunion (SS-216) was launched by Mrs Stanford Caldwell Hooper, (no photo) wife of Rear Admiral Hooper. He was born on 16 August 1884 in Colton, Cal. and graduated from the Naval Academy in 1905. Serving in various ships of the fleet, but always with an interest in the then new art of the "wireless", Hooper was appointed Fleet Radio Officer in 1912. A radio observer during the first part of World War I, he headed the Radio Division of the Bureau of Engineering until America's entry into the war. Hooper commanded Fairfax (DD-93) during 1917-18 while on convoy duty, and received the Navy Cross. 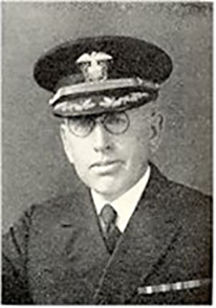 Following the war he became the guiding force behind the development of radio communications and electronics in the Navy, serving in various technical posts until his retirement in 1943. 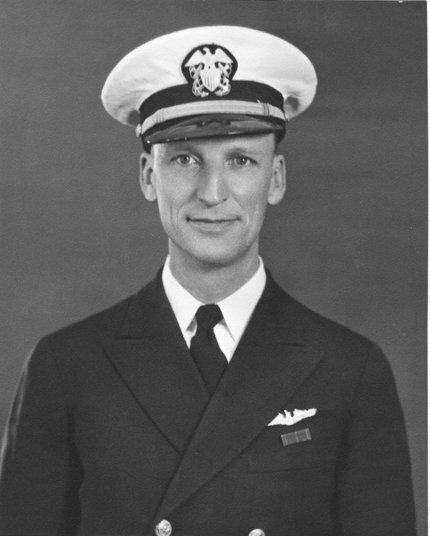 Rear Admiral Hooper was retained on active duty until 1945, and held offices with civilian firms in the electronics field until his death 6 April 1955. He was the recipient of many awards for his work in radio, and is honored annually by the Navy through the Rear Admiral S. C. Hooper Trophy, given to the outstanding electronics division in the Naval Reserve. Hooper (DE-1026) (1958-1973) was the first ship to be named in his honor. Photo courtesy of Navsource. 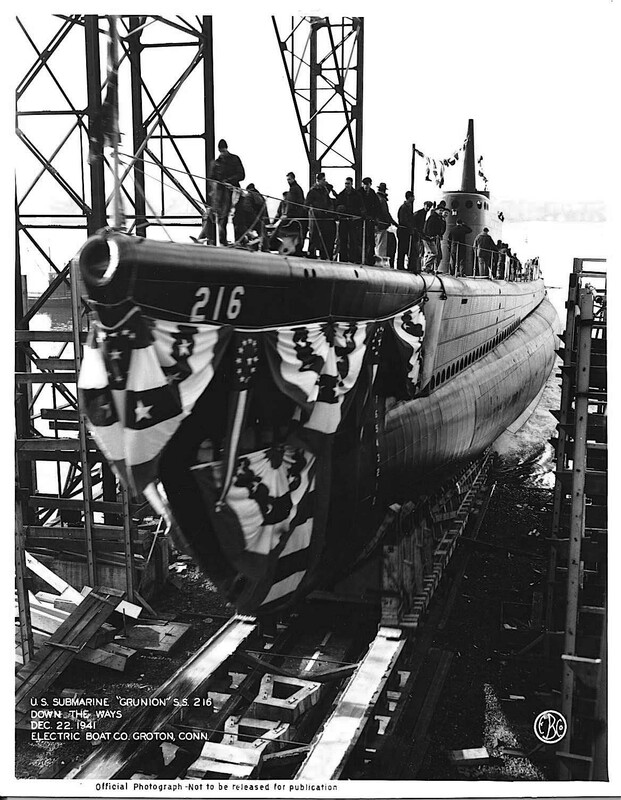 251k Stern view of the Grunion (SS-216) on the launching ways on 22 December 1941 at the Electric Boat Co., Groton, CT. Electric Boat Corporation photo courtesy of Bruce and John Abele, sons of Lieutenant Commander Mannert L. Abele, K.I.A., while commmanding the Grunion (SS-216), 30 July 1942. 229k The Grunion (SS-216) slides down the launching ways on 22 December 1941 at the Electric Boat Co., Groton, CT. Electric Boat photo courtesy of John Crouse of St Mary's Sub Museum / ussgrunion.com. 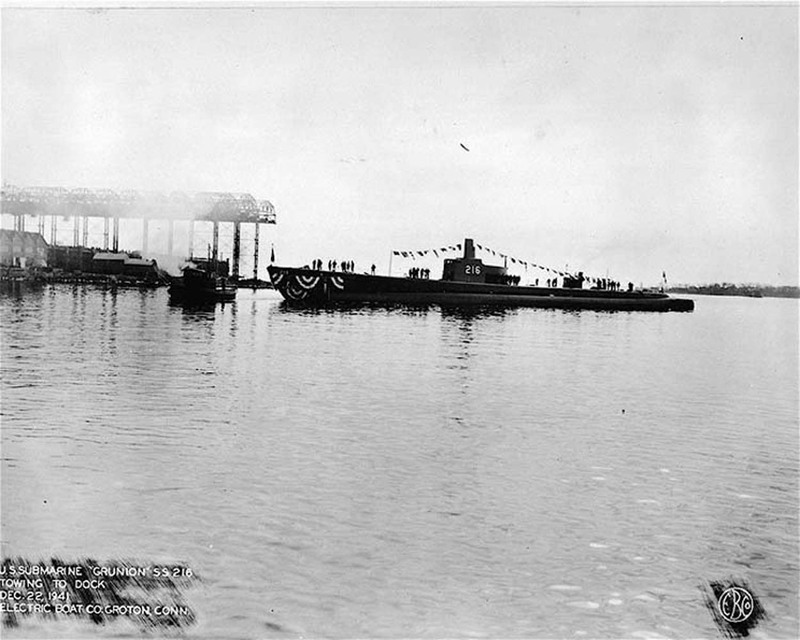 121k The Grunion (SS-216) being towed to dock immediately following her launching on 22 December 1941 at the Electric Boat Co., Groton, CT. Electric Boat Corporation photo courtesy of Bruce, Brad and John Abele, sons of Lieutenant Commander Mannert L. Abele, K.I.A., while commmanding the Grunion (SS-216), 30 July 1942. 23k Commemorative postal cover marking Grunion's (SS-216) launching, 22 December 1941. Courtesy of Jack Treutle (of blessed memory). 291k Growler (SS-215), bow view looking aft on 30 December 1941. 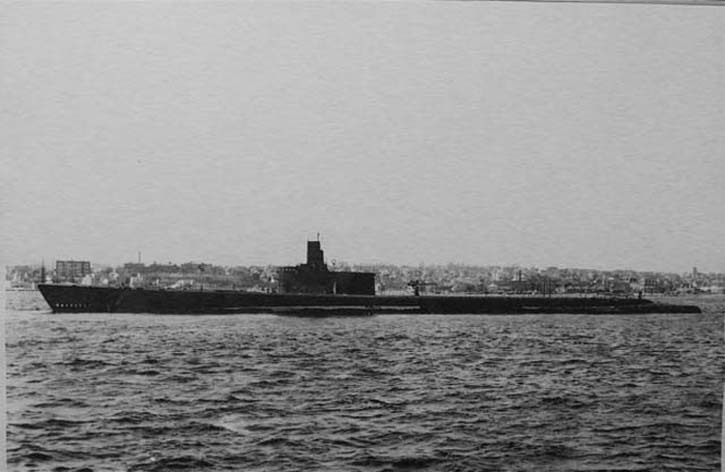 The Grunion (SS-216) is behind her, having been launched just 8 days before. She only has one periscope installed while Growler has two. Text i.d. courtesy of Ric Hedman & Robert Morgan. Electric Boat photo # BS 31129 via NARA College Park, courtesy of Tracy White @ Researcher @ Large. 197k Grunion (SS-216), bow looking aft on 30 December 1941. Electric Boat photo # BS 31060 via NARA College Park, courtesy of Tracy White @ Researcher @ Large. 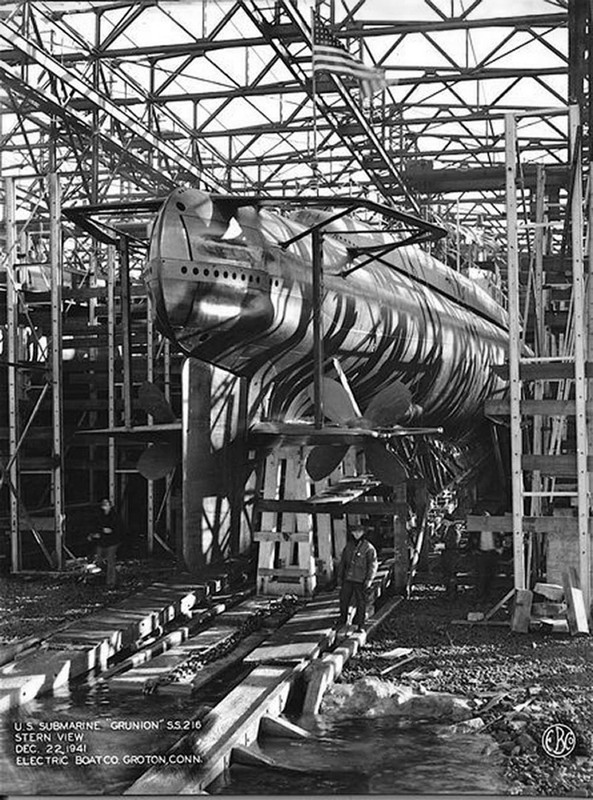 46k Grunion (SS-216), upon completion at Electric Boat Company in March, 1942. This configuration with the enclosed shears was as designed. Soon this was cut away to lessen the surface silhouette. This was done in stages during the course of the war. 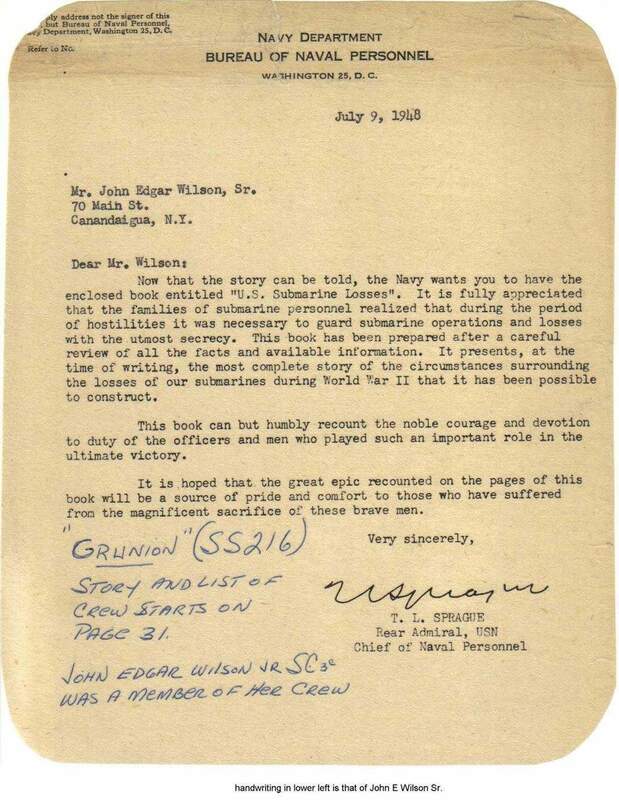 Text courtesy of The Floating Drydock, Fleet Subs of WW II by Thomas F. Walkowiak. USN photo courtesy of Bruce, Brad and John Abele, sons of Lieutenant Commander Mannert L. Abele, K.I.A., while commmanding the Grunion (SS-216), 30 July 1942. 431k Grunion (SS-216) bow view at rest, off Groton, Connecticut, 20 March 1942. Electric Boat Corporation photo courtesy of ussubvetsofworldwarii.org. 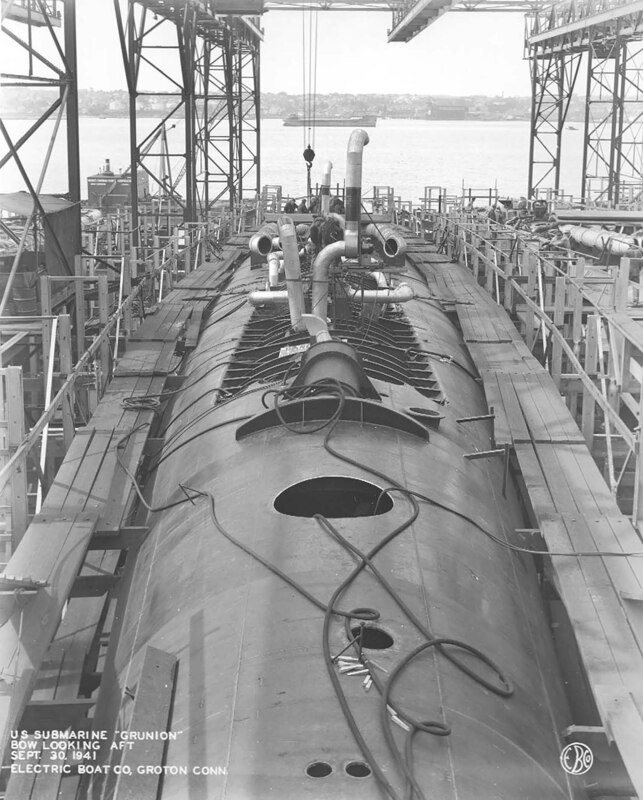 406k Stern view of the Grunion (SS-216) at rest, 20 March 1942 at the Electric Boat Co., Groton, CT. Electric Boat Corporation photo courtesy of ussubvetsofworldwarii.org. 572k Lieutenant Commander Mannert L. Abele, 11 April 1942. USN photo # 80-G-456784 courtesy of the National Museum of the U.S. Navy, via flickr.com. 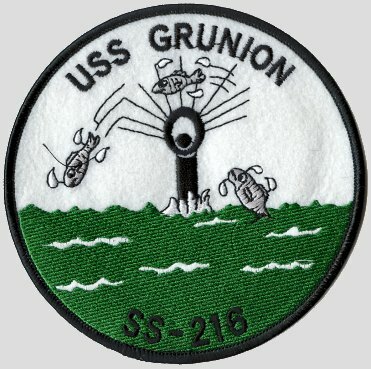 9k PDF article written by Brad Abele about the loss of the Grunion (SS-216). Pictured is Lieutenant Commander Mannert L. Abele on the bridge of the Grunion, 11 April 1942. USN photo courtesy of Bruce, Brad and John Abele, sons of Lieutenant Commander Mannert L. Abele, K.I.A., while commmanding the Grunion (SS-216), 30 July 1942. 30k The Grunion (SS-216) heading up the Thames River following her commissioning at the Electric Boat Co., Groton, CT. on 11 April 1942. USN photo courtesy of Bruce, Brad and John Abele, sons of Lieutenant Commander Mannert L. Abele, K.I.A., while commmanding the Grunion (SS-216), 30 July 1942. 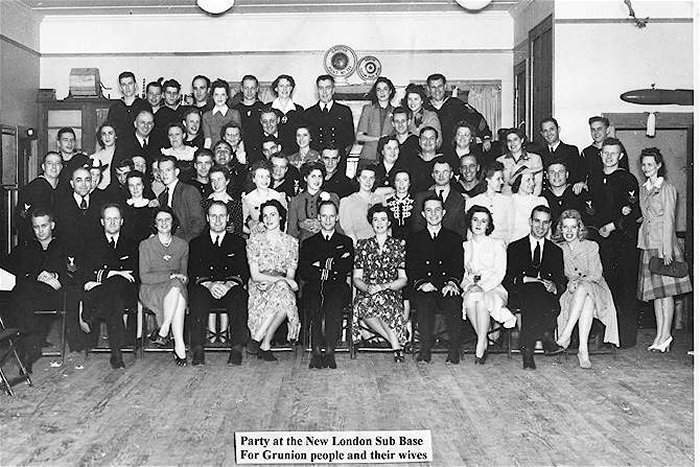 1.14k Commissioning party photo of the Grunion's (SS-216) crew and wives enjoying the evening at the New London Sub Base, CT. on 11 April 1942. Identified members are listed below. USN photo courtesy of Bruce, Brad and John Abele,sons of Lieutenant Commander Mannert L. Abele, K.I.A., while commmanding the Grunion (SS-216), 30 July 1942. My dear Mrs. Martin: Your husband, Carson Raymond Martin, Chief Motor Machinist's Mate, U.S. Navy, formerly attached to the Grunion, was certified by the former Commanding office of the submarine to have been aboard when it submerged to a maximun dept of 315 feet, on May 7th, 1942, in Block Island Sound. 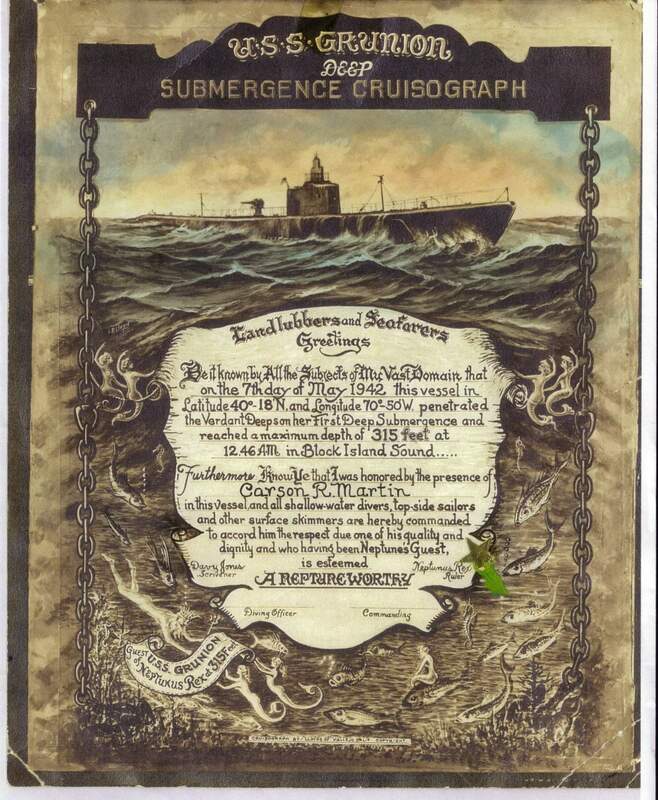 In recognition of this accomplishment, A Deep Submergence Certificate was ordered for him at that time, but unfortunately, it cannot now be delivered to him. It can neither be signed by the Diving Officer or the Commanding Officer, since they are likewise among the missing personnel. The Bureau feels that you will greatly treasure this certificate as a memento of your husband's service, and is pleased to forward it to you. Head of Casualties and Allotments Section by direction. USN photo courtesy of Meryl Kretschmann, daughter of Carson Martin, K.I.A. aboard the Grunion (SS-216), 30 July 1942. 453k Map showing the approximate location where Grunion (SS-216) picks up 16 survivors from the American merchant Jack that was torpedoed and sunk on 27 May 1942 by the German submarine U-558 about 100 miles southwest of Port Salut, Haiti in position 17.36N, 74.42W. 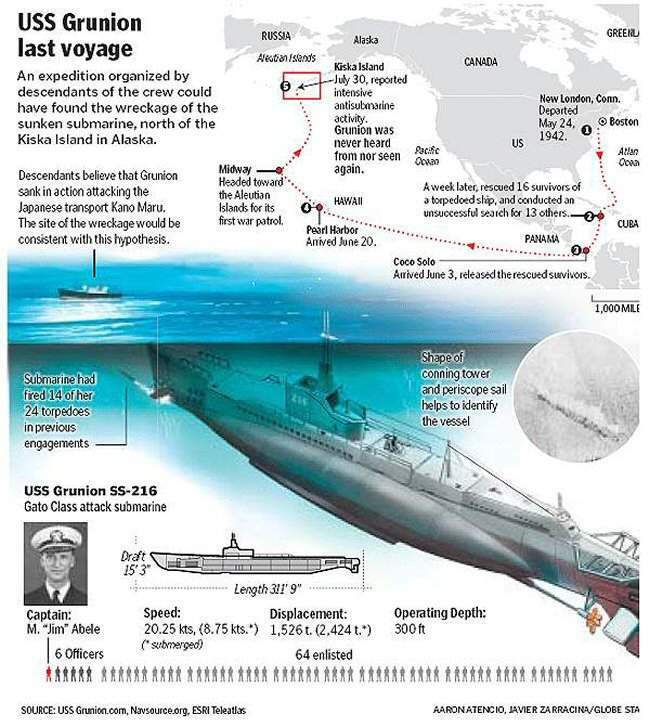 Photo courtesy of Great Circle Mapper - � Karl L Swartz & text courtesy of uboat.net. 348k Aleutian Islands Campaign, June 1942 - August 1943. Allied Landing on Kiska Island, 15 August 1943. Map of Kiska, undated. USN photograph . Photographed through Mylar sleeve. USN photo # Lot-803-13 courtesy of the National Museum of the U.S. Navy, via flickr.com. 138k Subchaser No. 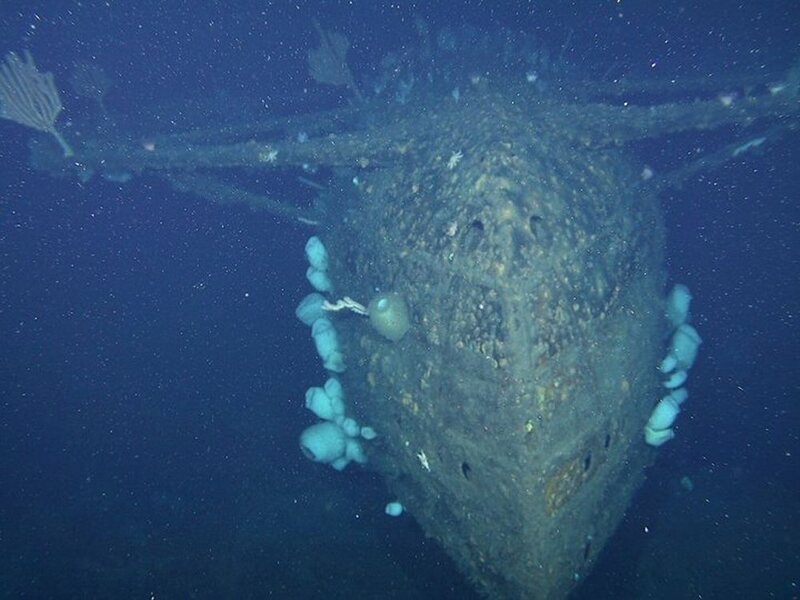 21 (indicative of the class of submarine chasers which the Grunion (SS-216) sank). Photo courtesy of combinedfleet.com. 454k Map showing the approximate location where Grunion (SS-216) torpedoes and sinks the Japanese submarine chasers Ch 25 and Ch 27 (both 460 tons) west of Sredni Point, Kiska, Aleutians in position 52.02N, 177.42E. Grunion would be lost not far from this position. Photo courtesy of Goggle Earth. 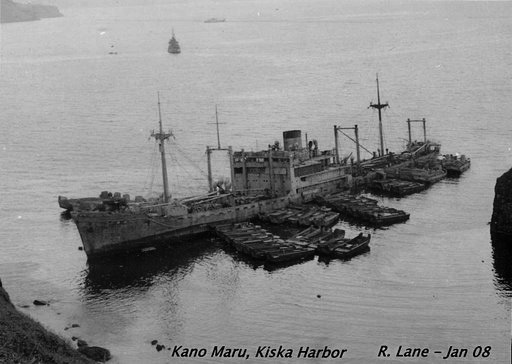 100k The Kano Maru in Kiska Harbor, 1942. Photo courtesy of Richard Lane via ussgrunion.com. 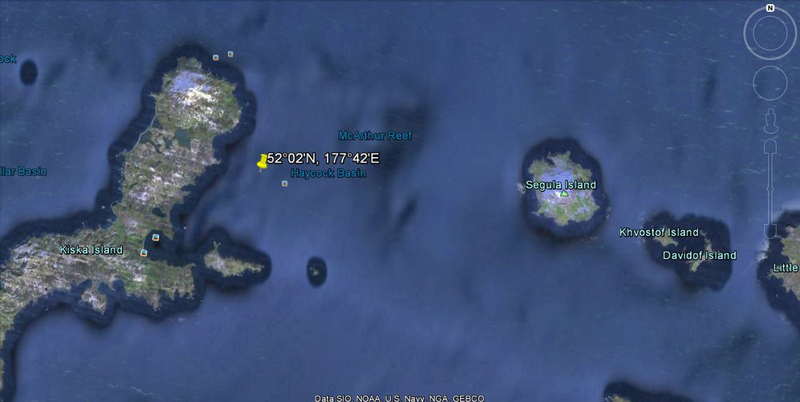 726k Situated to the northeast of Little Sitkin in the Rat Islands is the 6 km by 7 km island of Segula. 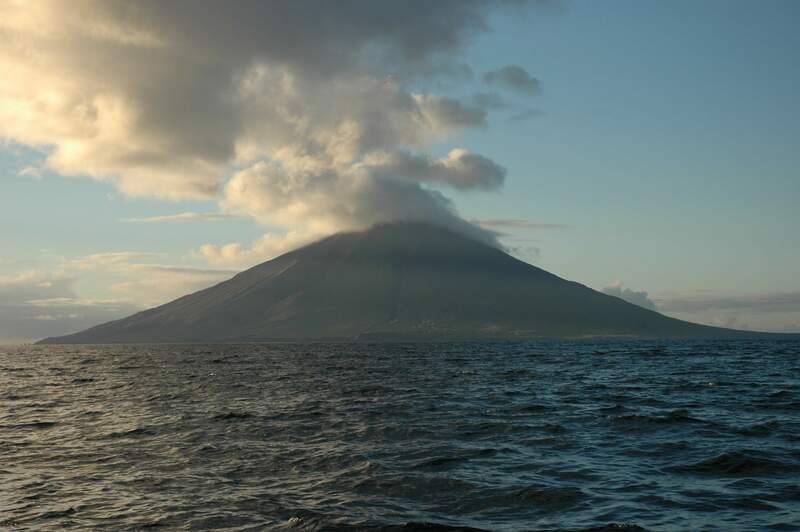 The island is dominated by its 1,153 meter high volcano. The Grunion (SS-216) would be lost not far from this position. Note: Segula is a Hebrew word meaning treasure. Photo ISS005-E-18284 was taken on 23 October 2002 00:43 UTC, courtesy of Earth Sciences and Image Analysis Laboratory, NASA Johnson Space Center., via oceandots.com. 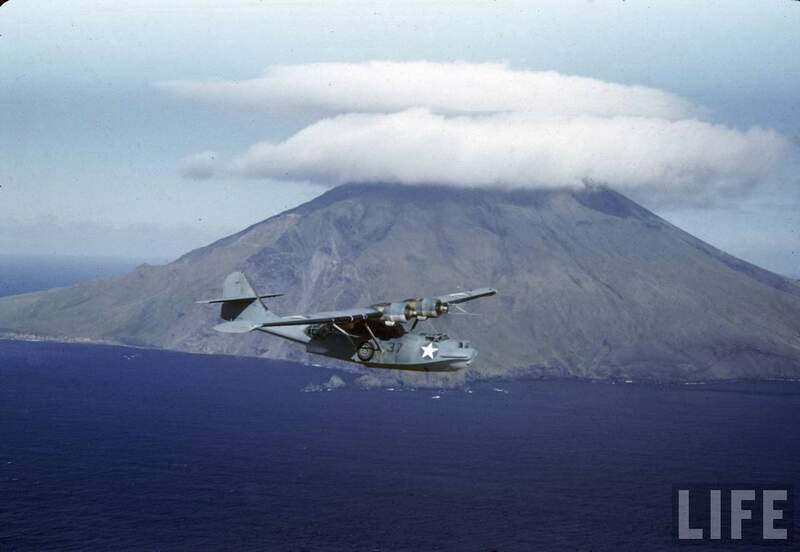 146k US Navy PBY patrol plane flying past Segula Island in the Aleutian Islands, 1944. 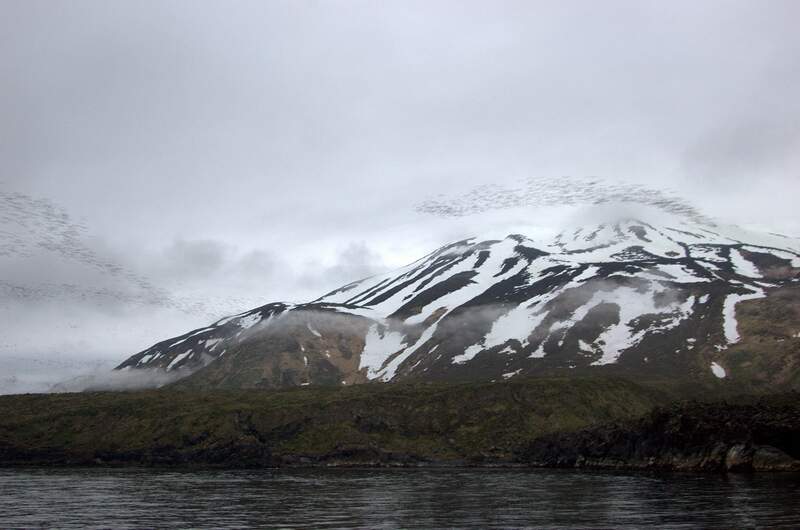 Photo from the Photo Essay The Aleutian Islands.Photographer: Dmitri Kessel, courtesy of Life. 376k Segula Volcano from the deck of the Maritime Maid. Southwest coastline. Picture Date: 27 September 2005 13:58:03. Photo courtesy of C. A. Neal, Alaska Volcano Observatory, the U.S. Geological Survey, BigTopo 7, and AllTopo 7 via avo.alaska.edu. 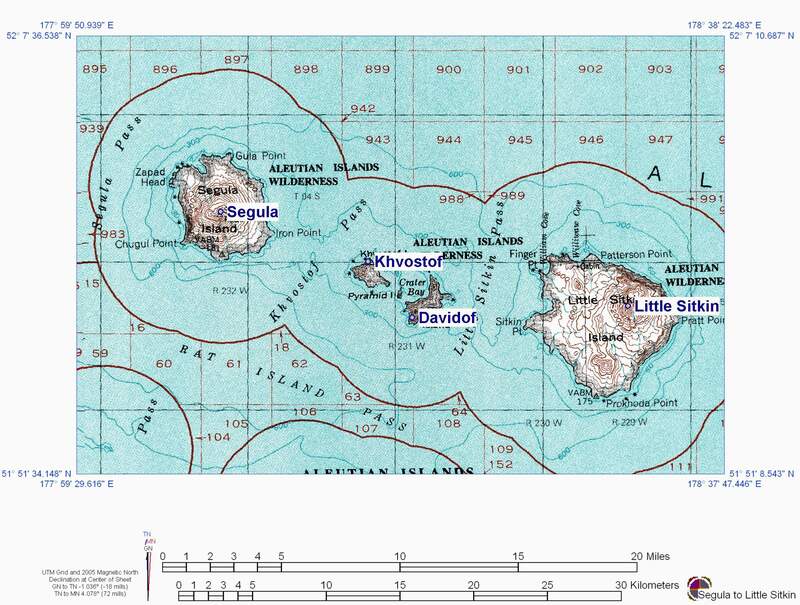 752k Topographic map of Little Sitkin, Khvostof, Davidof, and Segula. Picture Date: 2005. 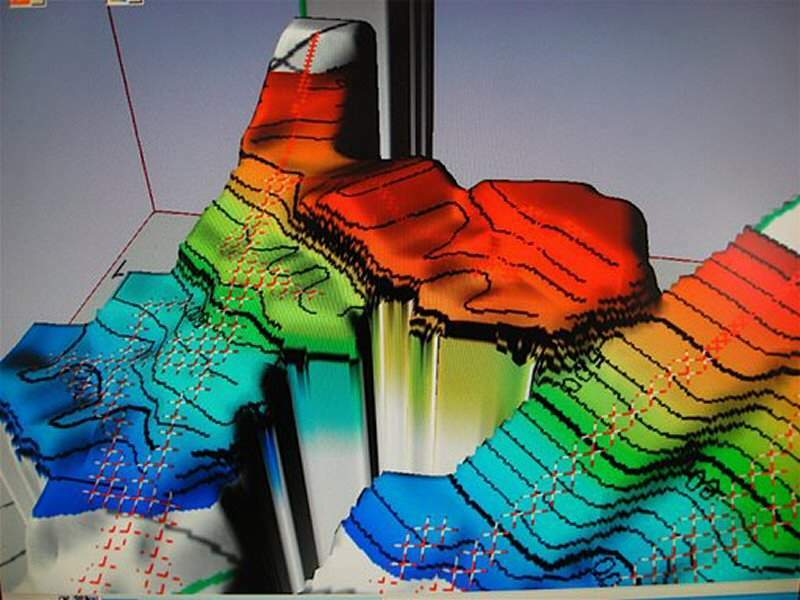 Photo courtesy of Alaska Volcano Observatory, the U.S. Geological Survey, BigTopo 7, and AllTopo 7 via avo.alaska.edu. 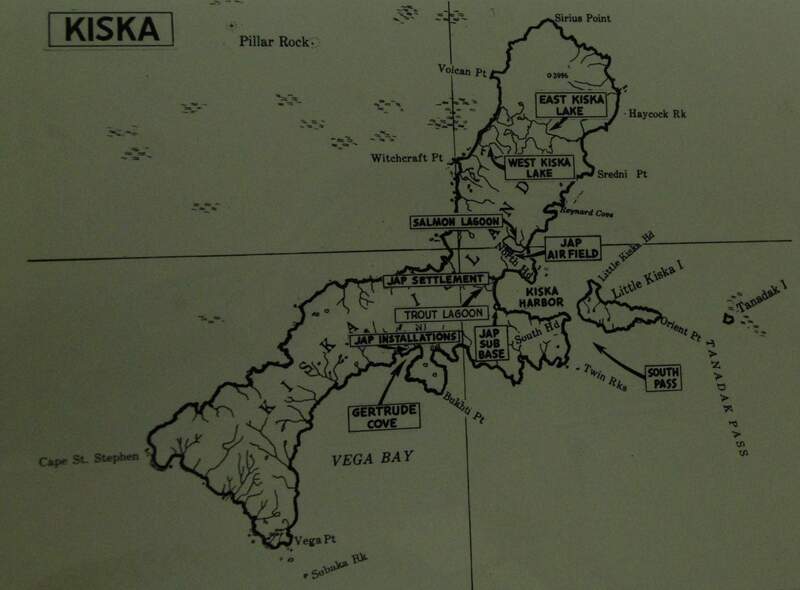 252k The Grunion's (SS-216) assigned operating area was off the island of Kiska, shown in detail in this map. Photo courtesy of U.S. Geological Survey, Amar Andalkar & skimountaineer.com. via Alaska Volcano Observatory & avo.alaska.edu. 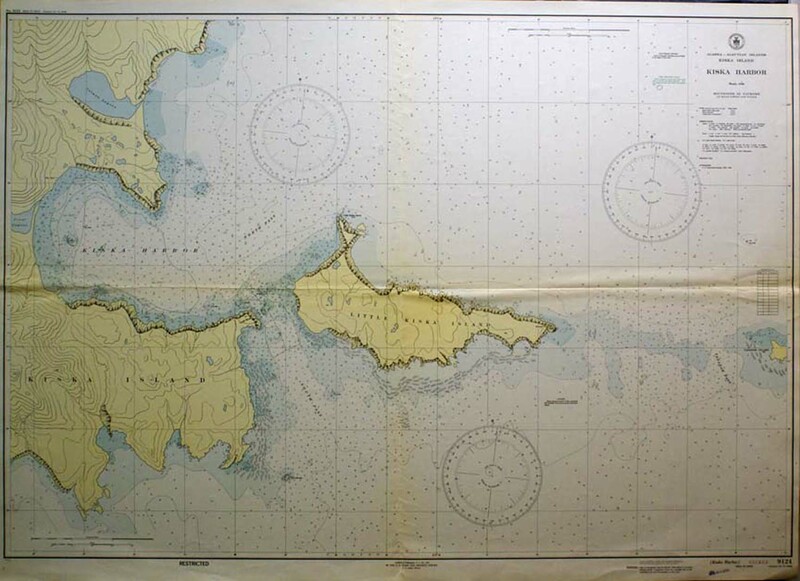 148k U. S. COAST & GEODETIC SURVEY "Preliminary Chart. 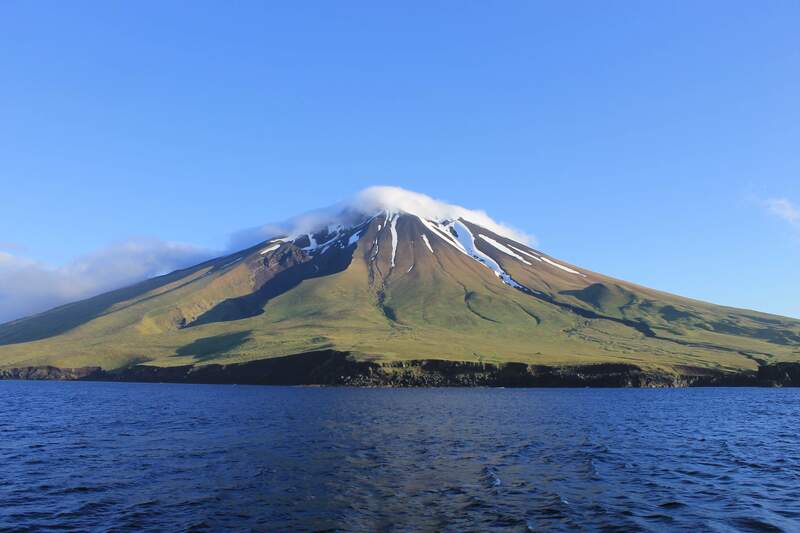 Aleutian Islands. Kiska Island & Kiska Harbor" Wash. D.C. 1944. Depicts shoreline topography with bays, inlets & passes & includes hundreds of depth soundings plus detailed courses & navigational notes. Once upon a time this and the below link worked! Photo courtesy of gracegalleries.com. Rare Old Maps of Alaska by Grace Galleries of Harpswell, Maine. 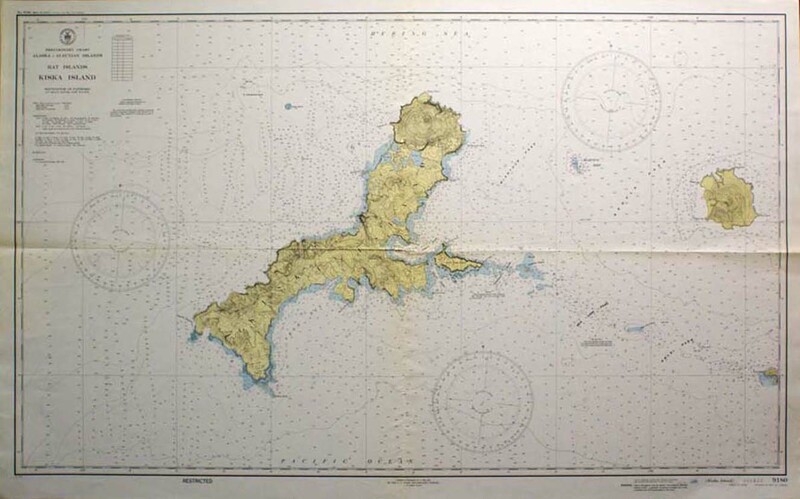 103k U. S. COAST & GEODETIC SURVEY "Preliminary Chart. 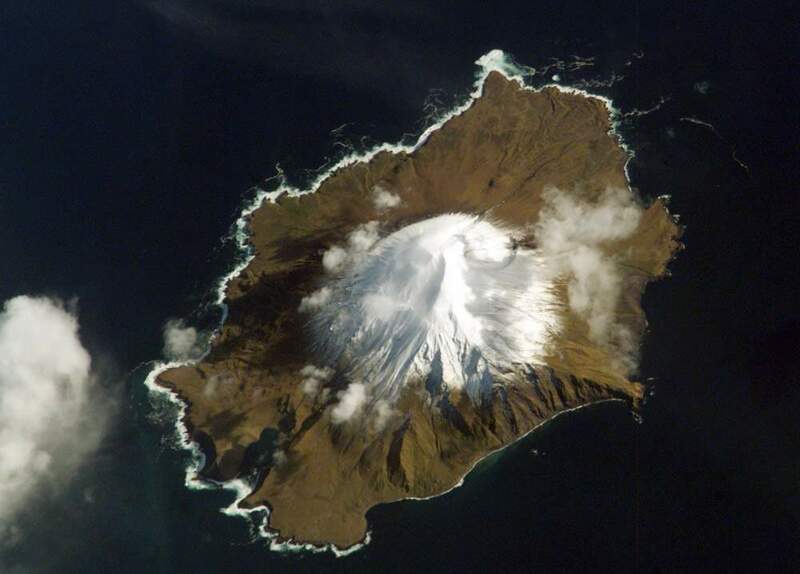 Alalska-Aleutian Islands. 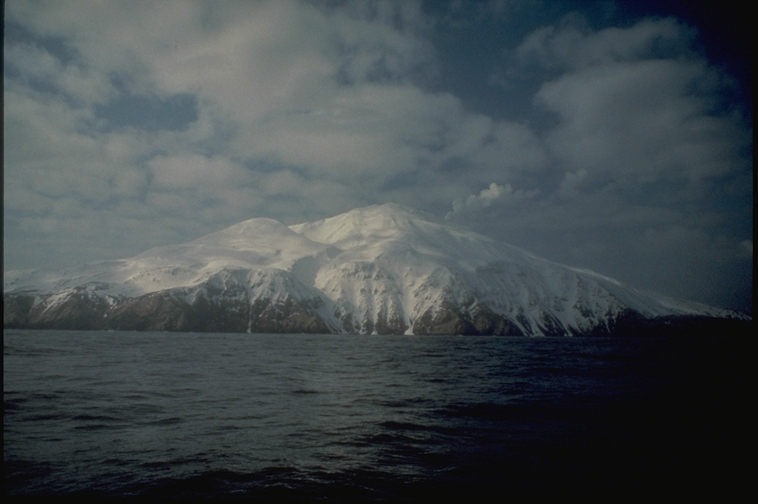 Kiska Island." Wash. D.C. 1944. Grey/blue/yellow color. 23X46. 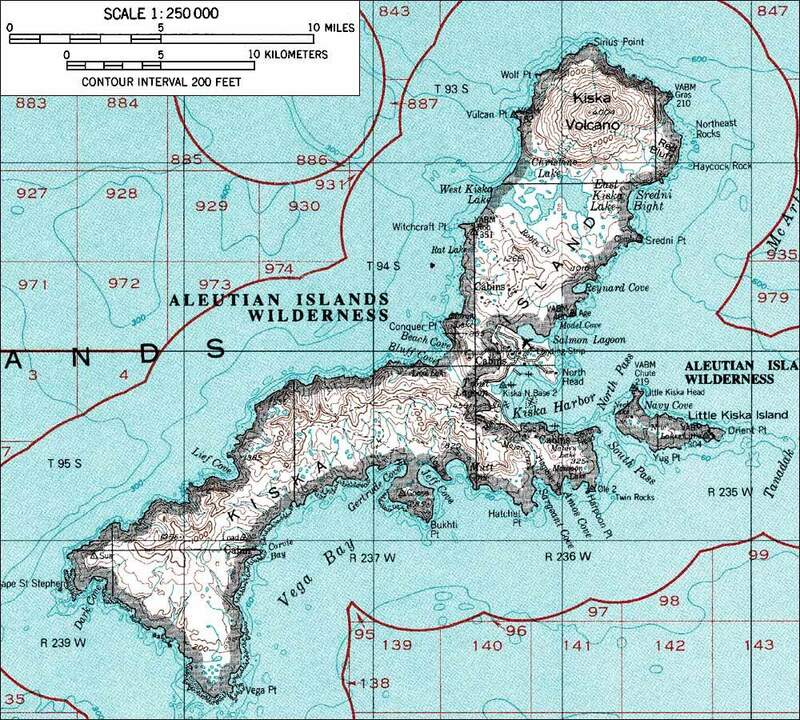 Fine large chart shows all of Kiska Island & depicts Vega Bay with topographical & hydrographical details. Locates Sea Lion Pass, Krysi Pass, Segula Island & Pass, McArthur Reef & Pass, and Rat Island. Includes thousands of depth soundings & depicts courses, buoys & beacons & navigational notes on tides, lights & abbreviations. Once upon a time this and the above link worked! 112k Full text of Ocean floor structures, northeastern Rat Islands, Alaska: in Investigations of Alaskan volcanoes, U.S. Geological Survey Bulletin B 1028-G, p. 161-167, 1 plate, scale 1:125,000.Snyder, G. L., 1957. Photo courtesy of Alaska Volcano Observatory & avo.alaska.edu. 1.62k Plate of Ocean floor structures, northeastern Rat Islands, Alaska: in Investigations of Alaskan volcanoes, U.S. Geological Survey Bulletin B 1028-G, p. 161-167, 1 plate, scale 1:125,000.Snyder, G. L., 1957. Photo courtesy of Alaska Volcano Observatory & avo.alaska.edu. 455k Kiska volcano with some of the estimated 1.16 million Least Auklets and ~500,000 Crested Auklets at Sirius Point, on the north side of the volcano. Picture Date: 19 June 2008. Photo courtesy of Cyrus Read, E. Klett, U.S. Fish and Wildlife Service, Alaska Volcano Observatory, U.S. Geological Survey, via avo.alaska.edu. 95k Battle Map by Seilchi Aiura obtained by R. Cressman of Ship's History Museum, showing the locations of the Kano Maru & Grunion (SS-216). USN photo courtesy of Bruce, Brad and John Abele, sons of Lieutenant Commander Mannert L. Abele, K.I.A., while commmanding the Grunion (SS-216), 30 July 1942. 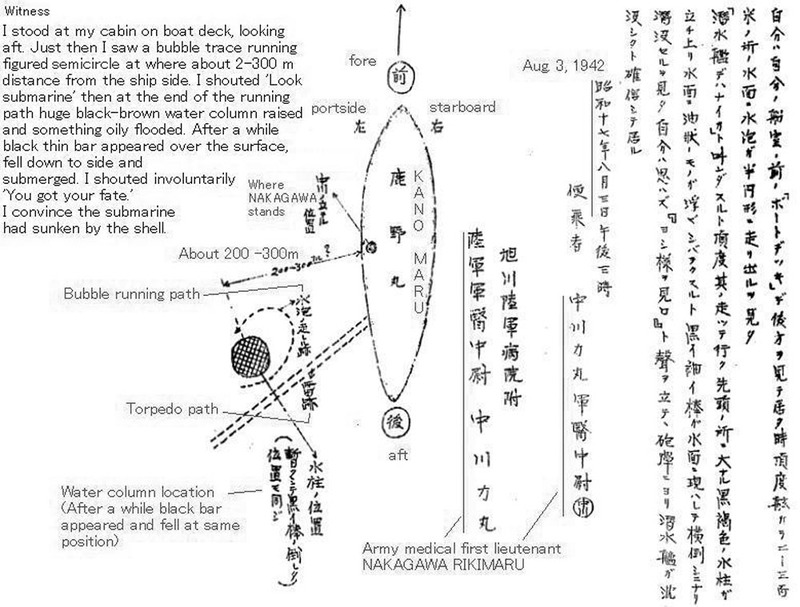 237k Copy of a page out of the Battle report and Battle Map article (written in Japanese) by Seilchi Aiura which shows a diagram produced by the author which describes the attack in some detail....If the diagram is accurate, then the Grunion (SS-216) was just moments away from reaching safety behind the stricken vessel when she was hit. This was probably what she was attempting by her maneuvers. 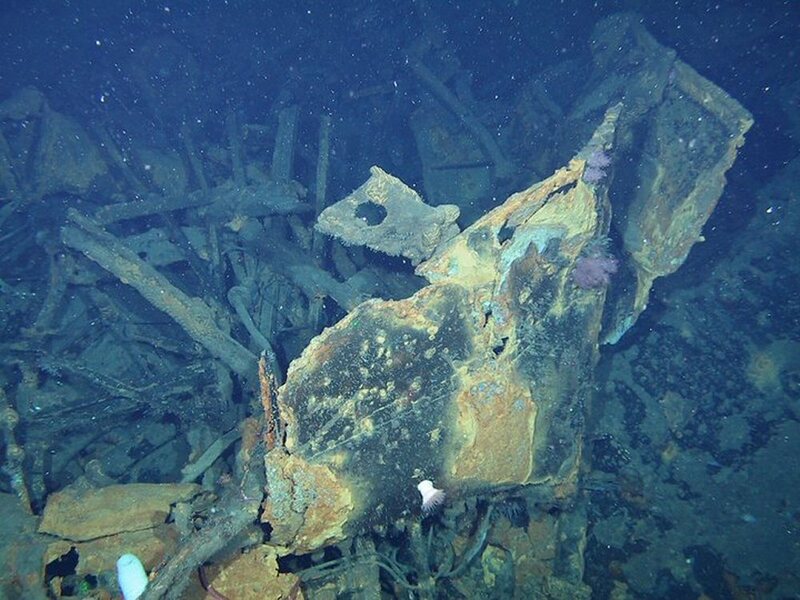 Whether she would have been safe from the 13mm gun at the rear of the Kano Maru is not known. It also shows the path of the Grunion and the location and direction of each of the six shots. The dotted line is sometimes a path of bubbles and the solid line is where the periscope was up and spotted. At the end of the path is where the 8cm shell hit the wave caused by the conning tower. From Aiura "confirmed direct hits and exploding sound was heard and then tremendous amount of dark brown liquid was flushing out from the sea." From another witness that saw the explosion "after a while a black thin bar appeared on the surface then fell and submerged". USN photo courtesy of Bruce, Brad and John Abele, sons of Lieutenant Commander Mannert L. Abele, K.I.A., while commmanding the Grunion (SS-216), 30 July 1942. Text courtesy of Bruce Abele & ussgrunion.com. 146k Copy of a page out of the Battle report and Battle Map article (written in Japanese) with English translation which shows a diagram produced by the author which describes the attack in some detail. Photo & text courtesy of Bruce Abele. 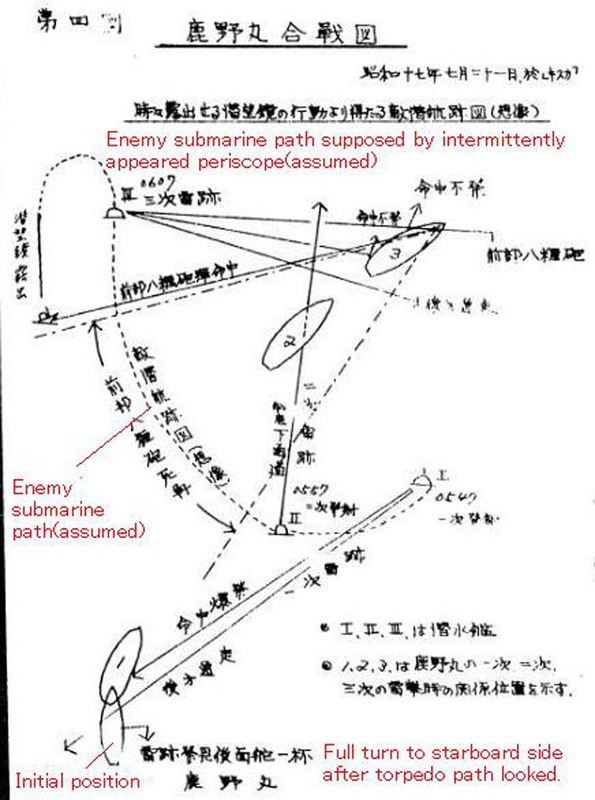 141k Copy of a page out of the Battle report and Battle Map article (written in Japanese) with English translation which shows a diagram produced by the author which describes the attack in some detail. Photo & text courtesy of Bruce Abele. 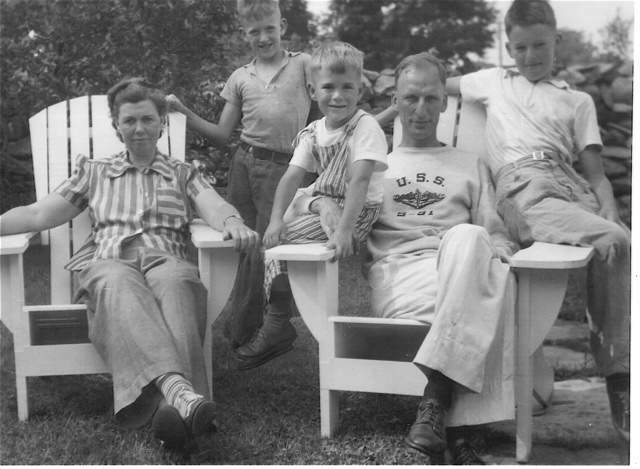 41k Informal family photo of Commander Mannert L. Abele and his wife Catherine & sons Bruce, Brad and John Abele sometime shortly before his loss. Photo courtesy of Bruce, Brad and John Abele,sons of Lieutenant Commander Mannert L. Abele, K.I.A., while commmanding the Grunion (SS-216), 30 July 1942. 43k Grunion's (SS-216) 30 year old Engineering Officer, Lieut. 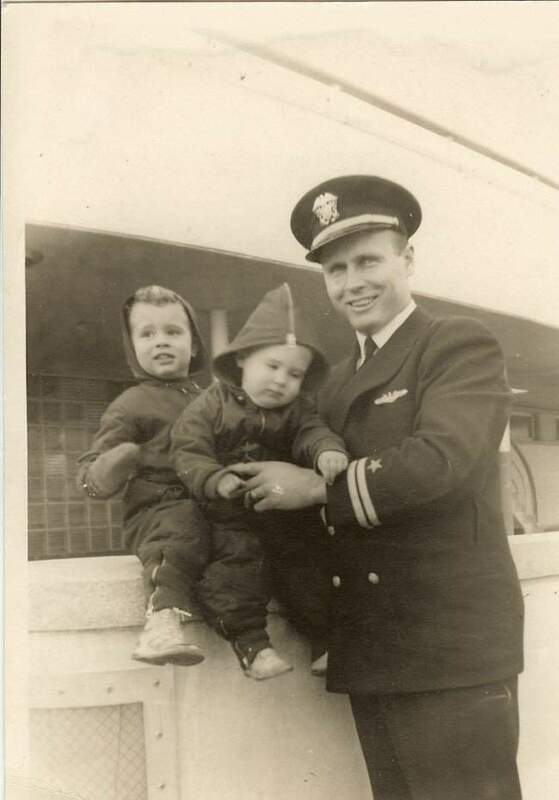 John Merton McMahon USN, with his two sons, Mike (left) and Jim McMahon (right). The photo was apparently taken in New London, Connecticut, shortly before the Grunion left for its deployment. Photo courtesy of Mike and Jim McMahon, sons of Lieut. John Merton McMahon, K.I.A., aboard theGrunion (SS-216), 30 July 1942. 124k A letter from Sec. 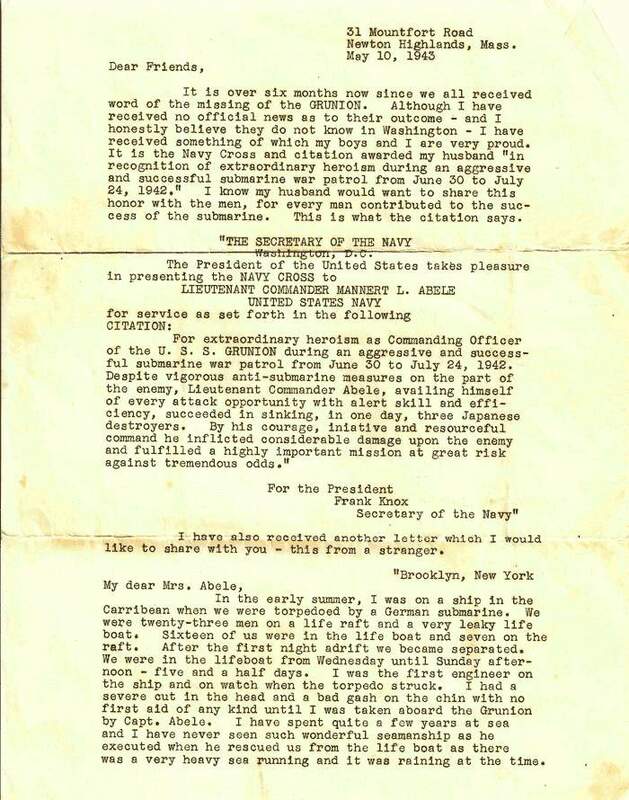 of the Navy Frank Knox to Lieutenant Commander Mannert L. Abele's wife Catherine on the awarding of a Navy Cross Medal and a citation to Lt. 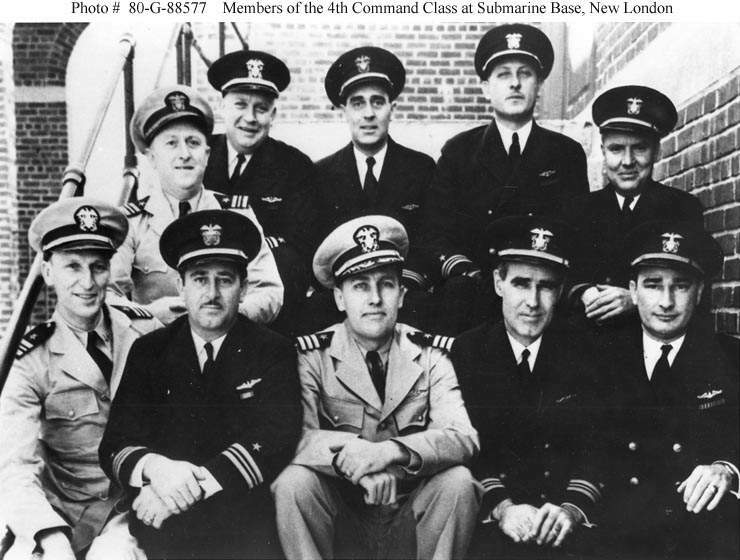 Commander Mannert L. Abele, upon the sinking of what was then thought of three Japanese Destroyers, but what later was found to be three submarine chasers & a letter from one of the crew of the American merchant Jack that was torpedoed and sunk on 27 May 1942 by the German submarine U-558 about 100 miles southwest of Port Salut, Haiti, describing their rescue by the Grunion (SS-216). Photo courtesy of Bruce, Brad and John Abele, sons of Lieutenant Commander Mannert L. Abele, K.I.A., while commmanding theGrunion (SS-216), 30 July 1942. 148k A letter from Sec. 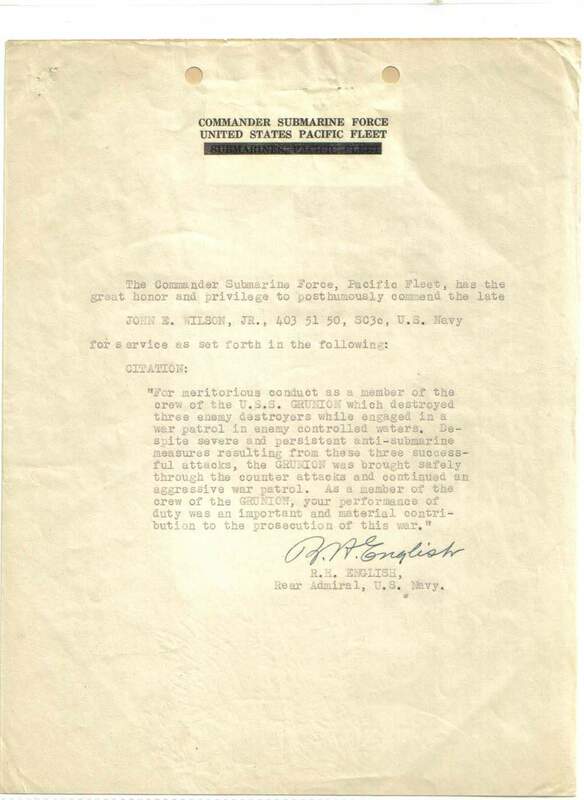 of the Navy Frank Knox to Lieutenant Commander Mannert L. Abele's wife Catherine on the awarding of a Navy Cross Medal and a citation to Lt. Commander Mannert L. Abele, upon the sinking of what was then thought of three Japanese Destroyers, but what later was found to be three submarine chasers & a letter from one of the crew of the American merchant Jack that was torpedoed and sunk on 27 May 1942 by the German submarine U-558 about 100 miles southwest of Port Salut, Haiti, describing their rescue by the Grunion (SS-216). Photo courtesy of Bruce, Brad and John Abele, sons of Lieutenant Commander Mannert L. Abele, K.I.A., while commmanding the Grunion (SS-216), 30 July 1942. 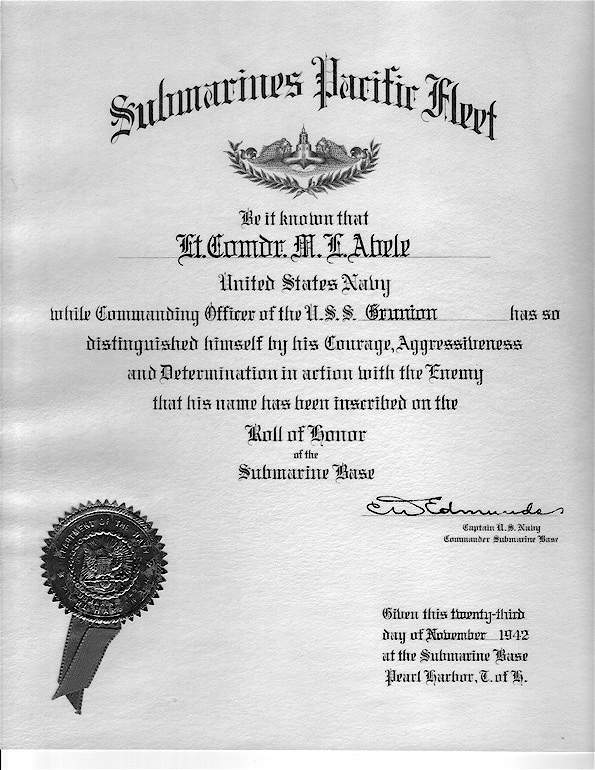 95k Mannert Lincoln Abele, Lieutenant Commander (Commanding Officer) of the Grunion (SS-216) at the time of her loss. USN photo courtesy of Bruce, Brad and John Abele, sons of Lieutenant Commander Mannert L. Abele, K.I.A., while commmanding the Grunion (SS-216), 30 July 1942. 141k Letter from the Labor - Management Committee of E.B. 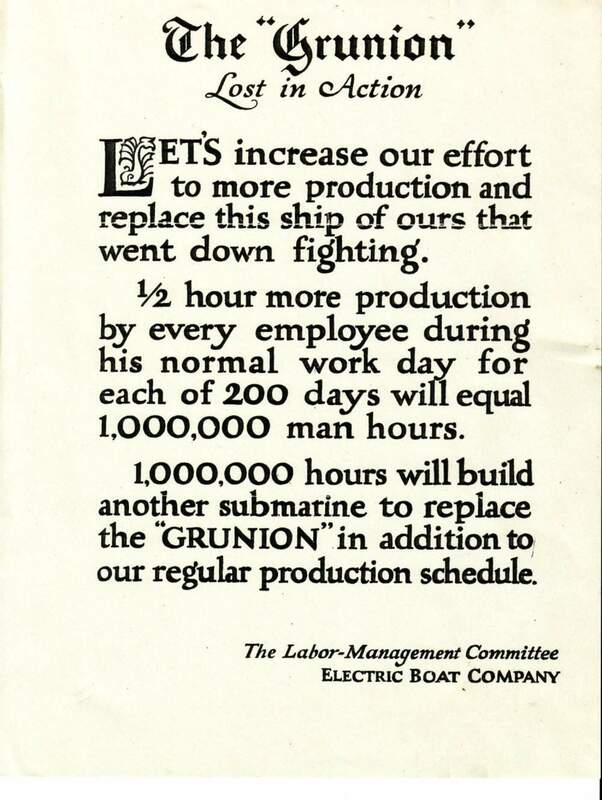 in the days following the Grunion's (SS-216) loss urging its workers for more production to replace the boat. Electric Boat photo courtesy of Meryl Kretschmann, daughter of Carson Martin, K.I.A. aboard the Grunion (SS-216), 30 July 1942. 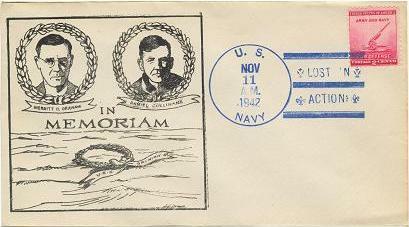 16k Commemorative postal cover marking Grunion (SS-216) on Eternal Patrol, issued on Veterans Day, 1942. Pictured are two of Grunion's crew, CTM Merritt Dayton Graham and MM1 Daniel Cullinane. Courtesy of Jack Treutle (of blessed memory). 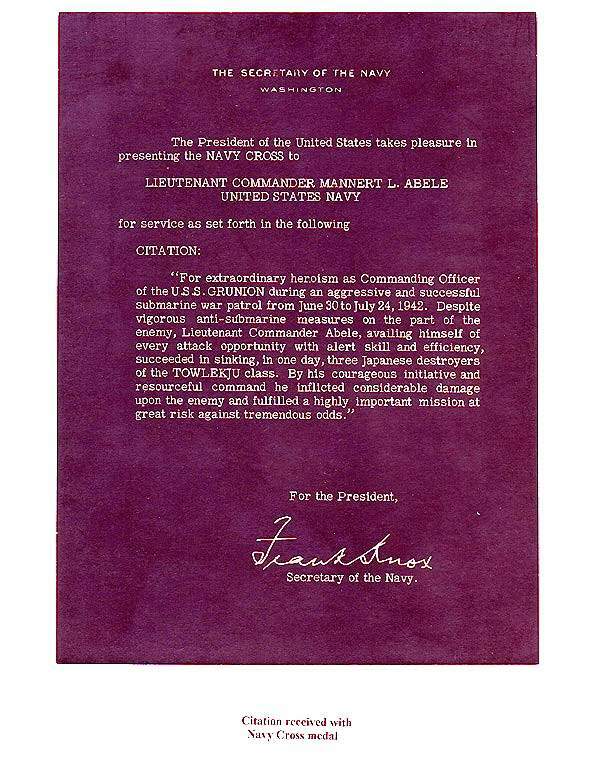 73k "Roll of Honor Citation by the Submarine Base, Pearl Harbor" in the name of Lieutenant Commander Mannert L. Abele, while CO of the Grunion (SS-216), during the boat's action against the Japanese and his "Courage, Aggressiveness and Determination in action with the enemy". Issued 23 November 1942. USN photo courtesy of Bruce, Brad and John Abele, sons of Lieutenant Commander Mannert L. Abele, K.I.A., while commmanding the Grunion (SS-216), 30 July 1942. 90k Citation signed by the SecNav Frank Knox on the presentation of the Navy Cross Medal to Lt. 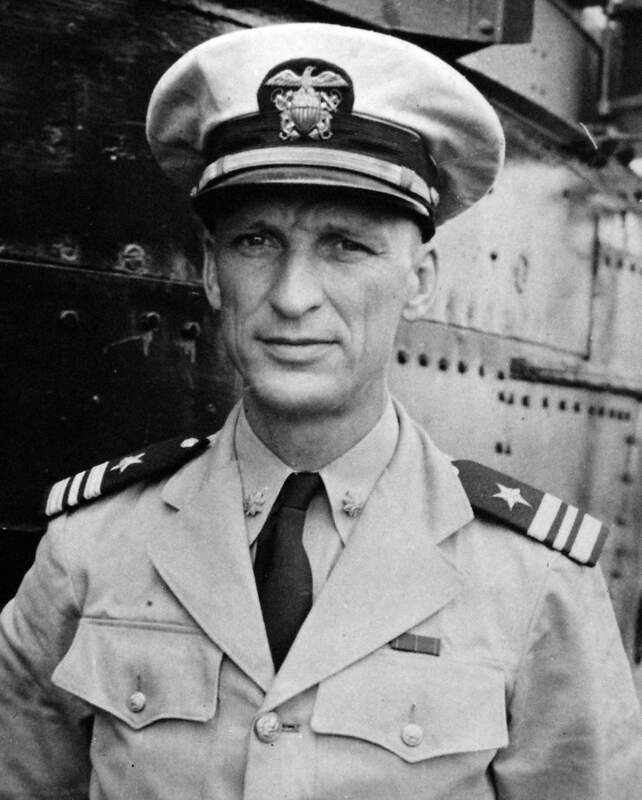 Commander Mannert L. Abele, upon the sinking of what was then thought of three Japanese Destroyers, but what later was found to be three submarine chasers, two of which Ch-25 and Ch-27 were sunk. In any case, the risk and danger was great. USN photo courtesy of Bruce, Brad and John Abele, sons of Lieutenant Commander Mannert L. Abele, K.I.A., while commmanding the Grunion (SS-216), 30 July 1942. 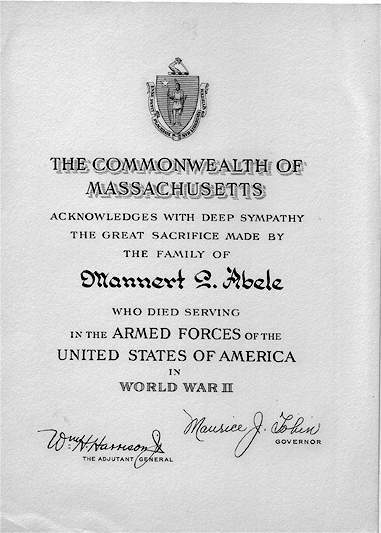 32k Citation by the Commonwealth of Massachusetts to the family of Lieutenant Commander Mannert L. Abele. USN photo courtesy of Bruce, Brad and John Abele, sons of Lieutenant Commander Mannert L. Abele, K.I.A., while commmanding the Grunion (SS-216), 30 July 1942. 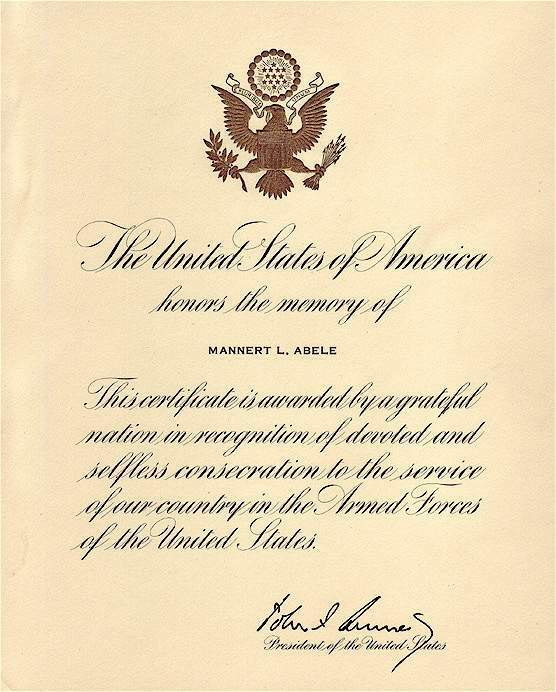 53k A certificate signed by President John F. Kennedy "honoring the memory of Lieutenant Commander Mannert L. Abele by a grateful nation in recognition of devoted and selfless consecration to the service of country in the Armed Forces of the United States". USN photo courtesy of Bruce, Brad and John Abele, sons of Lieutenant Commander Mannert L. Abele, K.I.A., while commmanding the Grunion (SS-216), 30 July 1942. 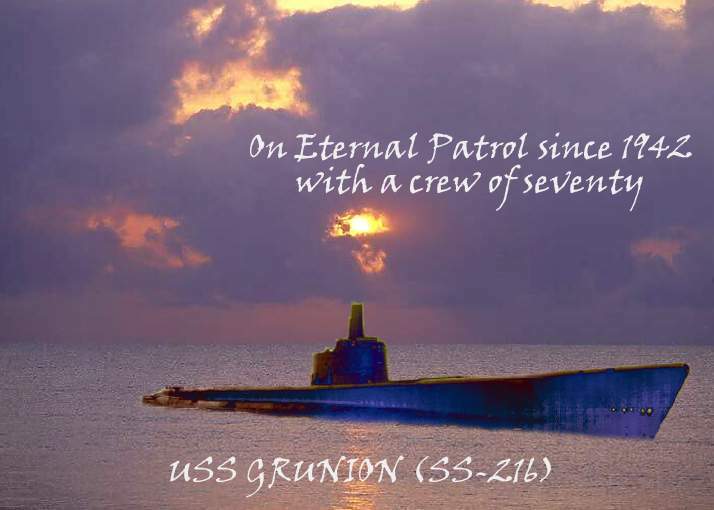 34k Commemorative photo in honor of the memory of the crew of the Grunion (SS-216). Photo courtesy of Tom Kermen. Dante's Prayer courtesy of Loreena McKennitt via quinlanroad.com. 176k Dedication and unveiling of the U.S. Submarine Veterans of WW II Memorial Wall to the families of the crew of the Grunion (SS-216), 1 - 3 September 1995. Photo courtesy of Meryl Kretschmann, daughter of Carson Martin, K.I.A. aboard the Grunion (SS-216), 30 July 1942. 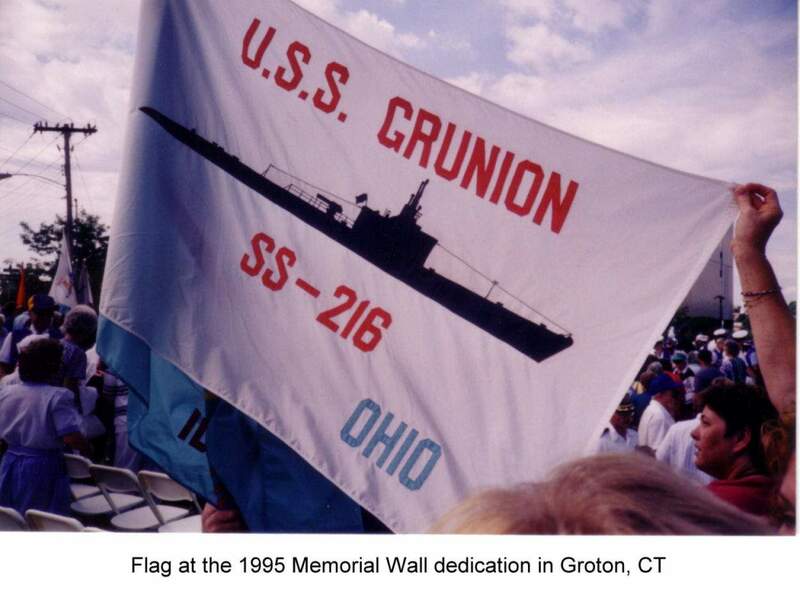 102k Grunion Flag at 1995 Memorial dedication. Photo courtesy of Meryl Kretschmann, daughter of Carson Martin, K.I.A. aboard the Grunion (SS-216), 30 July 1942. 123k True value for your dollar. 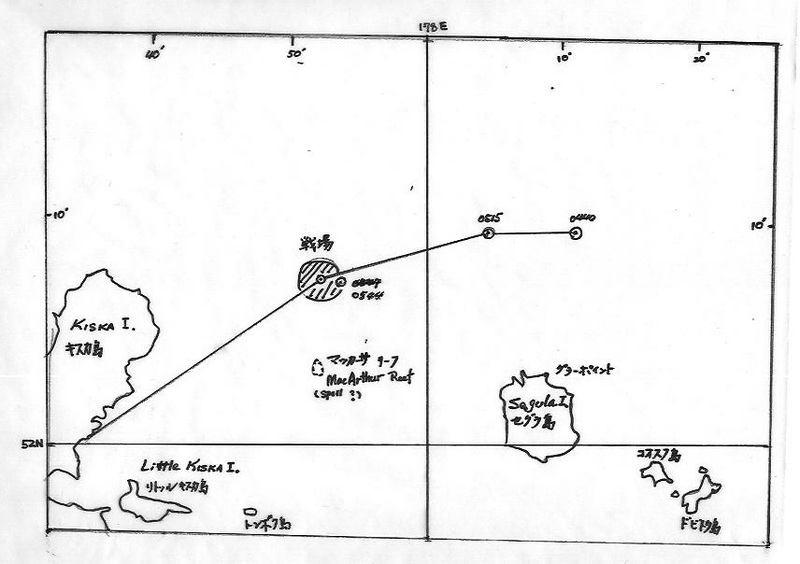 Lt. Col. Richard Lane's Kano Maru winch wiring diagram. It has casused quite a few more to be spent and helped unwrap one mystery of the sea while leading to others. Photo courtesy of ussgrunion.com. 86k Lt. Col. Richard Lane. Photo courtesy of ussgrunion.com. 22k Yutaka Iwasaki. Photo courtesy of ussgrunion.com. 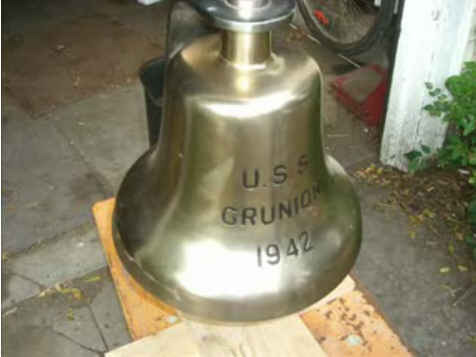 16k Grunion's (SS-216) Bell. Photo courtesy of ussgrunion.com. 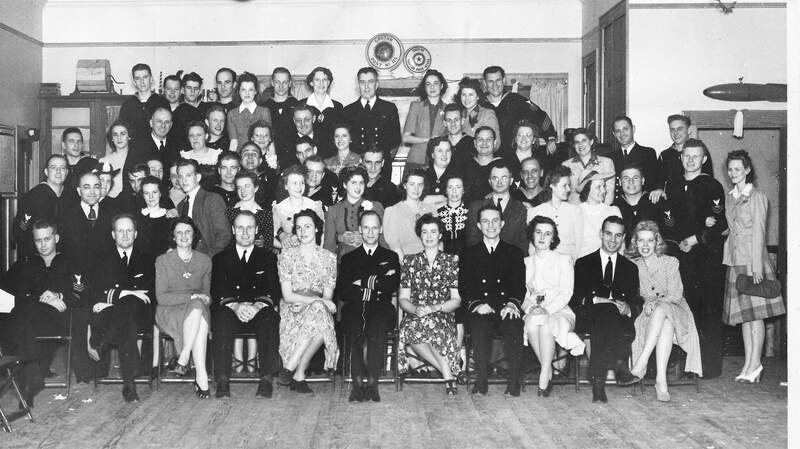 68k Untouched commissioning party photo of the Grunion's (SS-216) crew and wives enjoying the evening at the New London Sub Base, CT. on 11 April 1942. In a little less than 6 months, the boat and all her crew would be M.I.A. Photo i.d. courtesy of Mike McMahon, & Rhonda Raye. 69k Dedicated to all men lost while serving in the U.S. Submarine Force. Note: The one and only reason that this page is completley devoted to John Edgar Wilson Jr. is because I have received material covering what appears to be his entire period of service from enlistment & beyond. 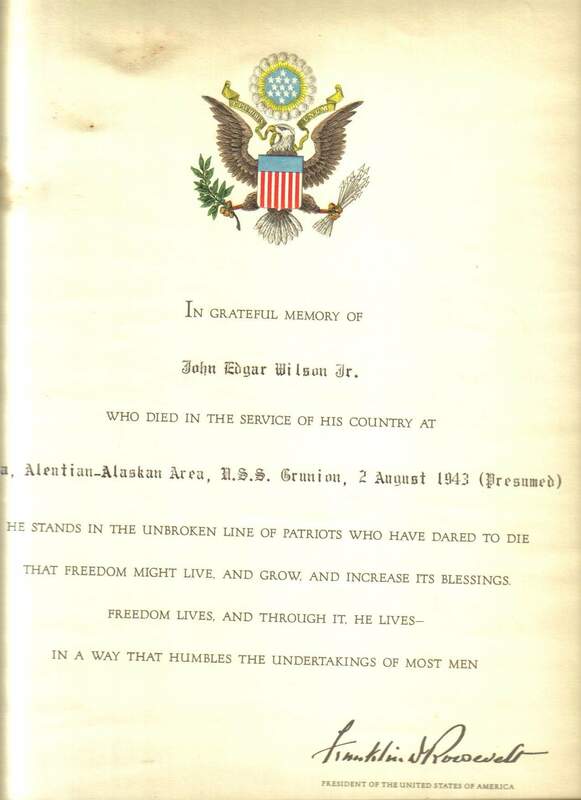 "In Grateful Memory of John Edgar Wilson Jr, who died in the service of his country at Aleutian - Alaskan Area, USS Grunion (SS-216), 2nd August 1943 (Presumed). He stands in the unbroken line of patriots who have dared to die that freedom might live, and grow and increase its blessings. Freedom lives, and through it, he lives - in a way that humbles the undertakings of most men." Signed by Franklin D. Roosevelt, President of the United States of America. 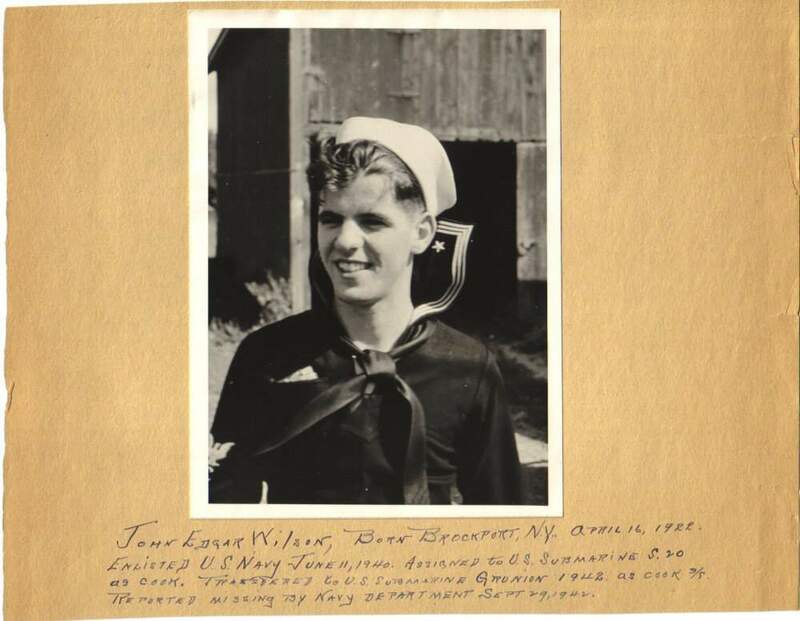 John Edgar Wilson Jr., Ship's Cook Third Class, age about 19 in this photo. Photo courtesy of John Edgar Wilson III, nephew of John Edgar Wilson Jr., K.I.A. aboard the Grunion (SS-216) with 69 other crewmen, 30 July 1942. 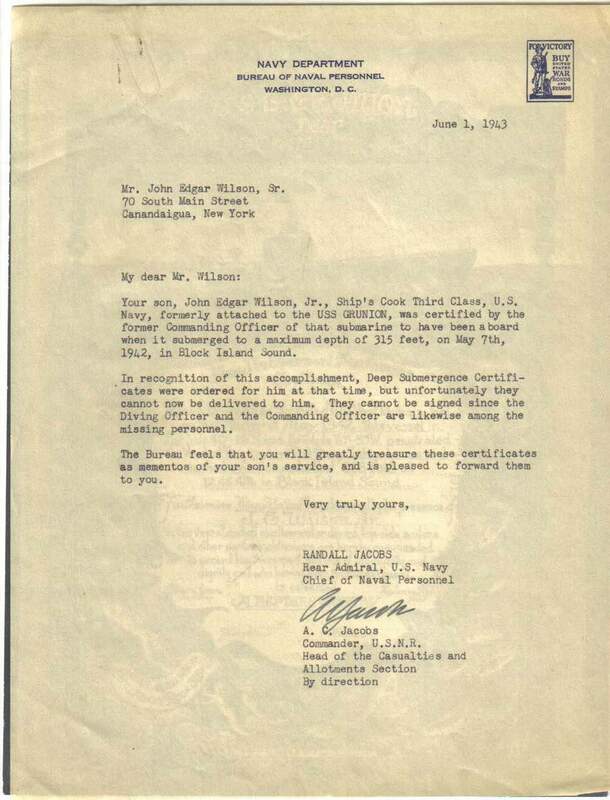 94k John Edgar Wilson Jr., certificate of discharge as an apprentice seaman from the USN Reserve to enlist in the US Navy., 10 June 1940. Photo courtesy of John Edgar Wilson III, nephew of John Edgar Wilson Jr., K.I.A. aboard the Grunion (SS-216) with 69 other crewmen, 30 July 1942. 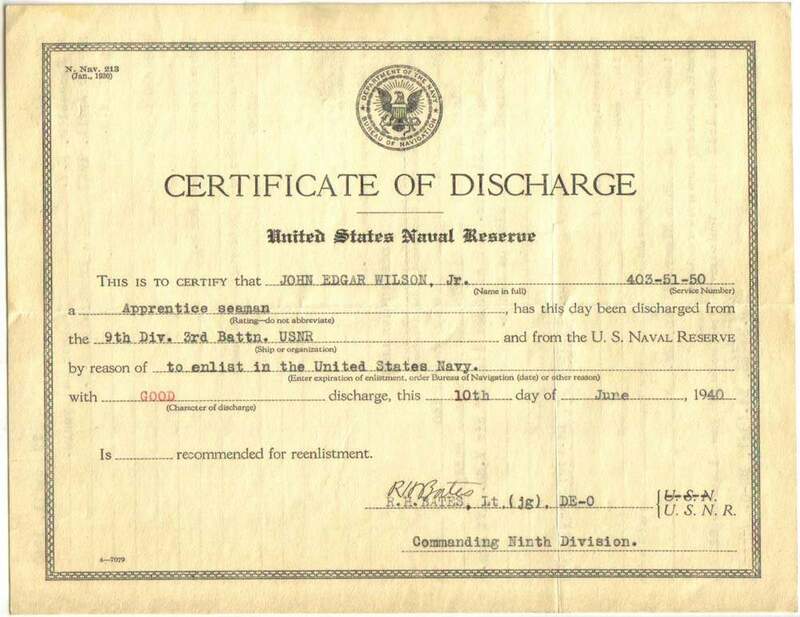 173k John Edgar Wilson Jr., certificate of discharge, reverse side. Photo courtesy of John Edgar Wilson III, nephew of John Edgar Wilson Jr., K.I.A. aboard the Grunion (SS-216) with 69 other crewmen, 30 July 1942. 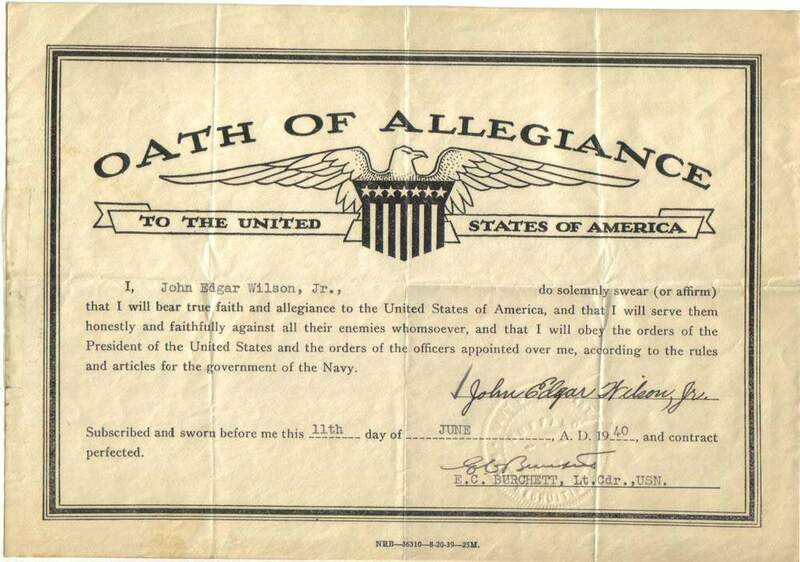 101k John Edgar Wilson Jr., oath of allegiance upon enlistment to the US Navy on 11 June 1940. Photo courtesy of John Edgar Wilson III, nephew of John Edgar Wilson Jr., K.I.A. aboard the Grunion (SS-216) with 69 other crewmen, 30 July 1942. 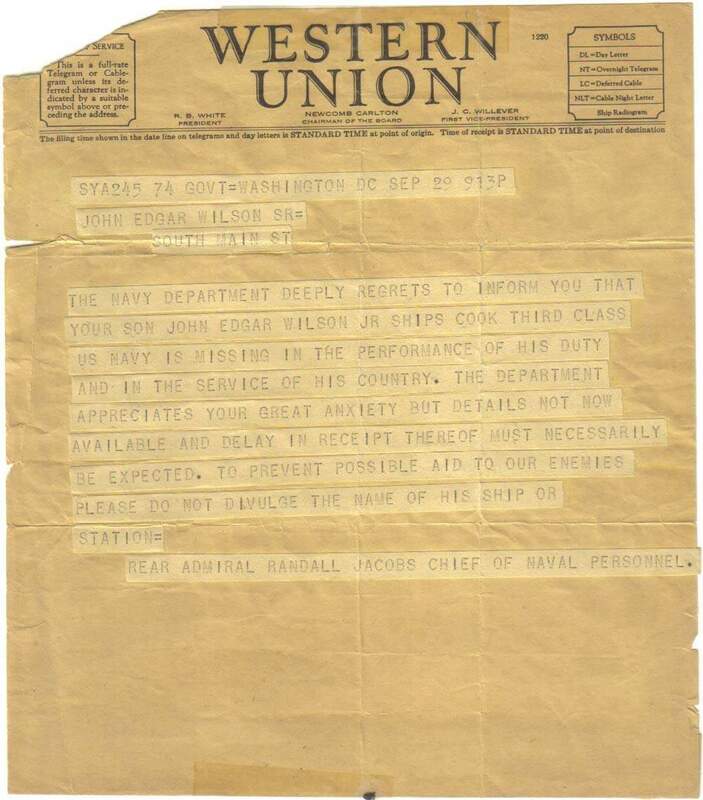 122k 29 September 1942 Western Union / MIA telegram for John Edgar Wilson Jr, Ship's Cook Third Class, aboard the Grunion (SS-216). Photo courtesy of John Edgar Wilson III, nephew of John Edgar Wilson Jr., K.I.A. aboard the Grunion (SS-216) with 69 other crewmen, 30 July 1942. 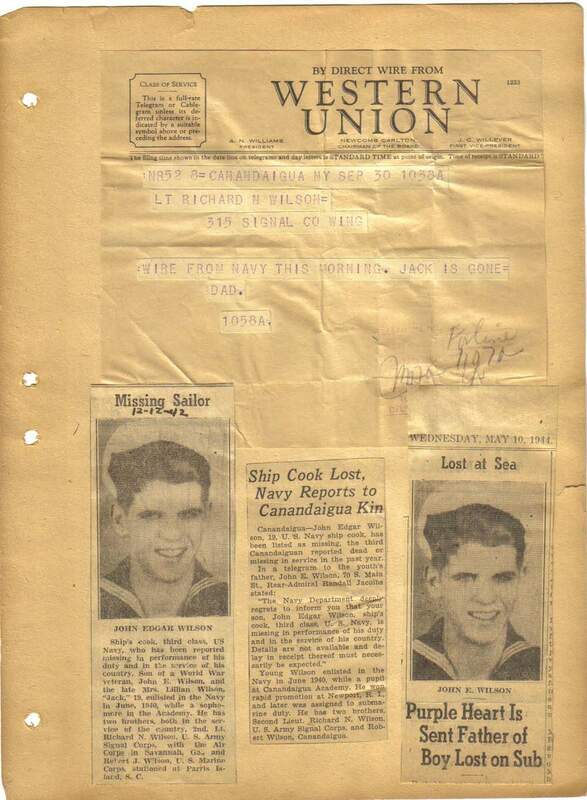 170k 30 September 1942 MIA article and telegram to LT. Richard N. Wilson from his father, John Edgar Wilson SR, informing him of the loss of his brother John Edgar Wilson Jr., Ship's Cook Third Class, aboard the Grunion (SS-216). Photo courtesy of John Edgar Wilson III, nephew of John Edgar Wilson Jr., K.I.A. aboard the Grunion (SS-216) with 69 other crewmen, 30 July 1942. 122k "In Grateful Memory of John Edgar Wilson Jr, who died in the service of his country at Aleutian - Alaskan Area Grunion (SS-216), 2nd August 1943 (Presumed). He stands in the unbroken line of patriots who have dared to die that freedom might live, and grow and increase its blessings. Freedom lives, and through it, he lives - in a way that humbles the undertakings of most men." Signed by Franklin D. Roosevelt, President of the United States of America. Photo courtesy of John Edgar Wilson III, nephew of John Edgar Wilson Jr., K.I.A. aboard the Grunion (SS-216) with 69 other crewmen, 30 July 1942. 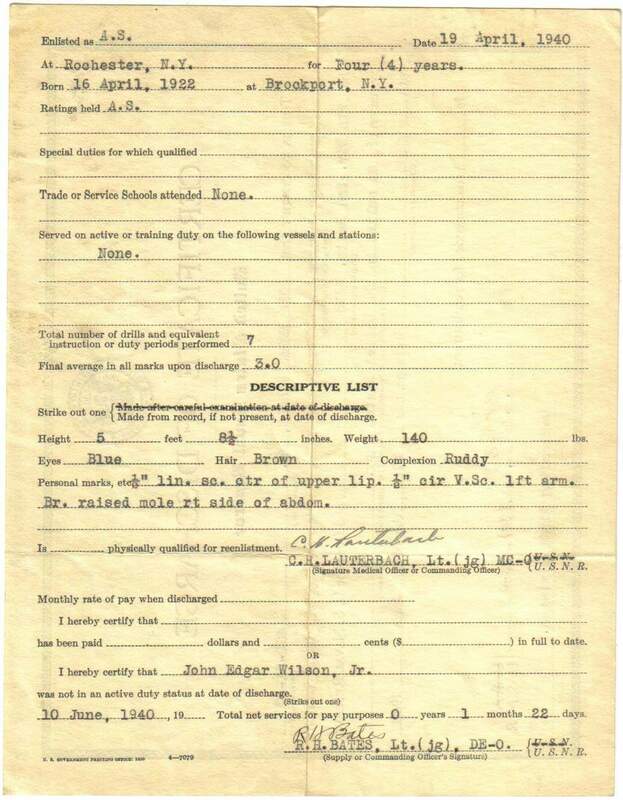 "For meritouous conduct as a member of the crew of the Grunion (SS-216) which destroyed three enemy destroyers. Despite severe and persistent anti-submarine measures reulting in these three successful attacks, the Grunion was brought safely through the counter attacks and continued an aggressive war patrol. As a member of the crew of the Grunion, your performance of duty was an important and material contribution to the prosecution of this war". Rear Admiral, US Navy. Photo courtesy of John Edgar Wilson III, nephew of John Edgar Wilson Jr., K.I.A. aboard the Grunion (SS-216) with 69 other crewmen, 30 July 1942. 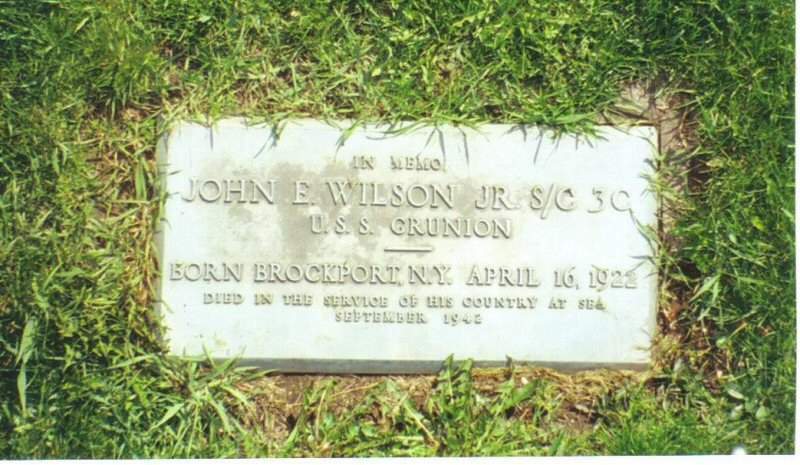 My dear Mr. Wilson: Your son, John Edgar Wilson JR, Ship's Cook Third Class, U.S. Navy, formerly attached to the Grunion, was certified by the former Commanding office of the submarine to have been aboard when it submerged to a maximun dept of 315 feet, on May 7th, 1942, in Block Island Sound. The Bureau feels that you will greatly treasure this certificate as a memento of your son's service, and is pleased to forward it to you. Head of Casualties and Allotments Section by direction. Photo courtesy of John Edgar Wilson III, nephew of John Edgar Wilson Jr., Grunion (SS-216) with 69 other crewmen, 30 July 1942. 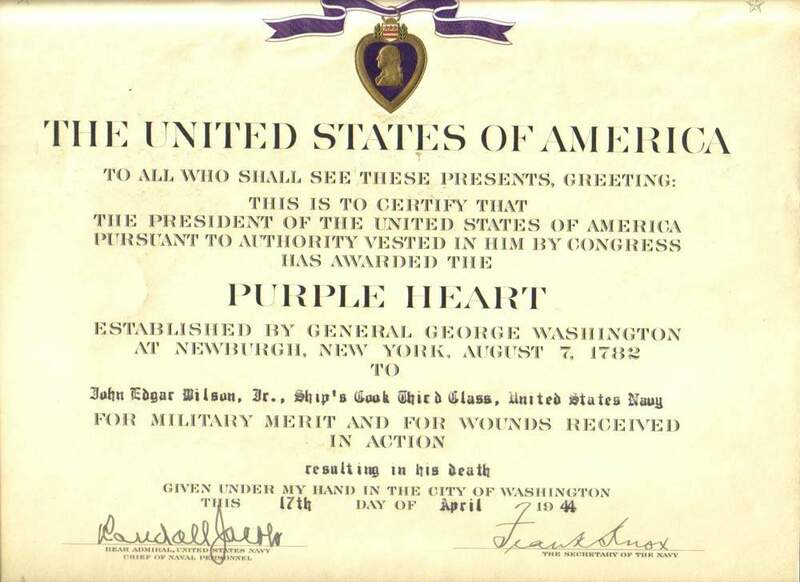 75k Purple Heart awarded to John Edgar Wilson Jr., Ship's Cook Third Class, on 17 April 1944. Photo courtesy of John Edgar Wilson III, nephew of John Edgar Wilson Jr., K.I.A. aboard the Grunion (SS-216) with 69 other crewmen, 30 July 1942. 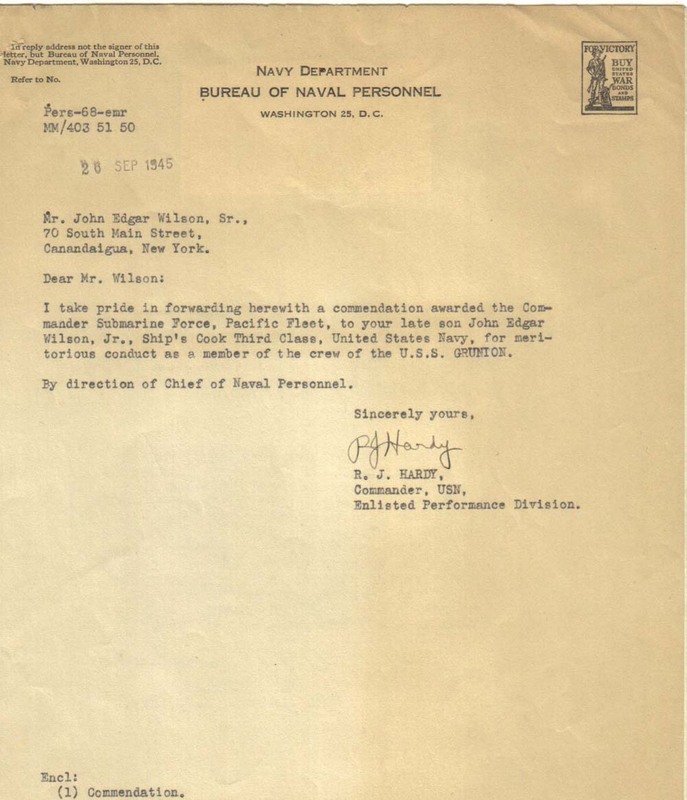 101k Commendation letter dated 26 September 1945, for meritorious conduct as a member of the crew of the Grunion (SS-216). Photo courtesy of John Edgar Wilson III, nephew of John Edgar Wilson Jr., K.I.A. aboard the Grunion (SS-216) with 69 other crewmen, 30 July 1942. 220k Letter from the Bureau of Navigation written on 9 July 1948 to the families of the crews whose sons were lost in action during WW II. 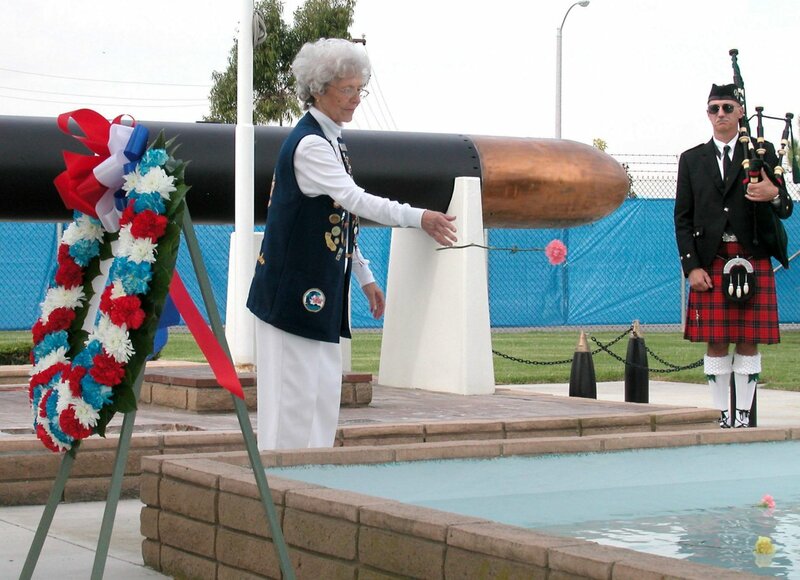 The families were presented with a book entitled "US Submarine Losses." Photo courtesy of John Edgar Wilson III, nephew of John Edgar Wilson Jr., K.I.A. aboard the Grunion (SS-216) with 69 other crewmen, 30 July 1942. 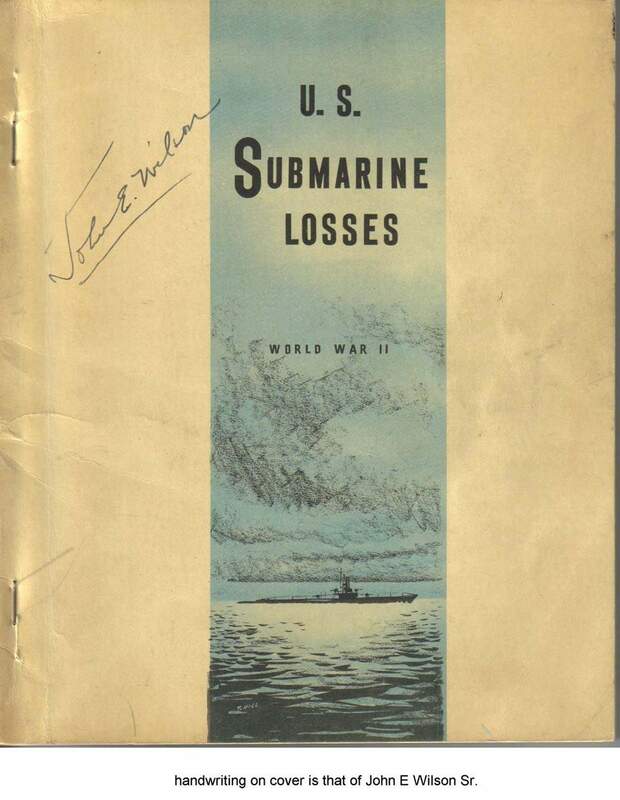 125k Front cover of "US Submarine Losses." Photo courtesy of John Edgar Wilson III, nephew of John Edgar Wilson Jr., K.I.A. aboard the Grunion (SS-216) with 69 other crewmen, 30 July 1942. 69k Memorial marker for John Edgar Wilson Jr, Ship's Cook Third Class, lost aboard the Grunion (SS-216). Photo courtesy of John Edgar Wilson III, nephew of John Edgar Wilson Jr., K.I.A. aboard the Grunion (SS-216) with 69 other crewmen, 30 July 1942. 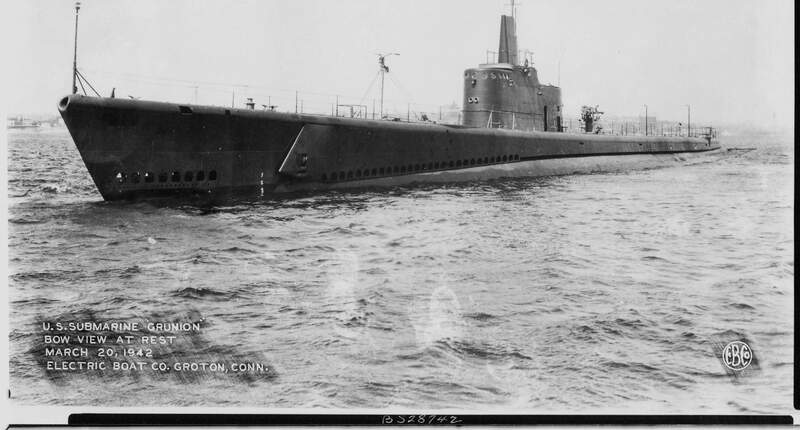 79k Last voyage of the Grunion (SS-216). Photo courtesy of boston.com. 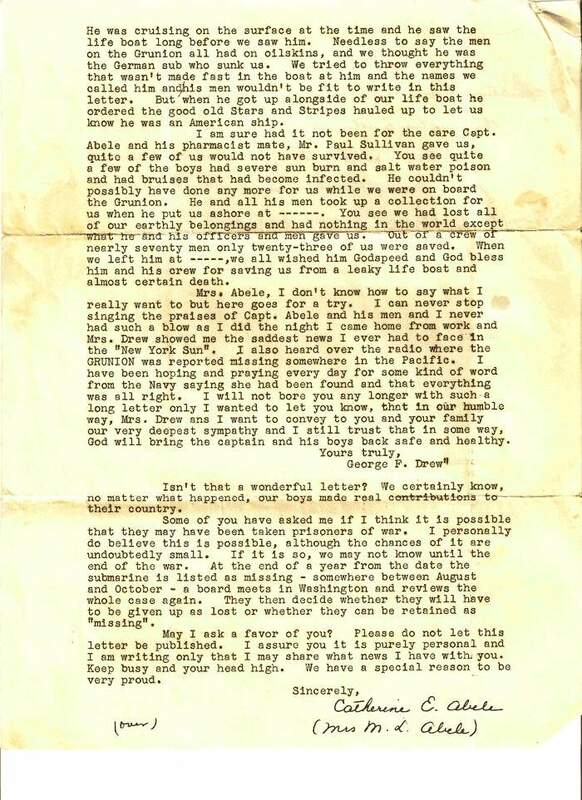 and submitted by John Shane, whose grandfather, Lieutenant Commander Louis Shane, Jr. was K.I.A. 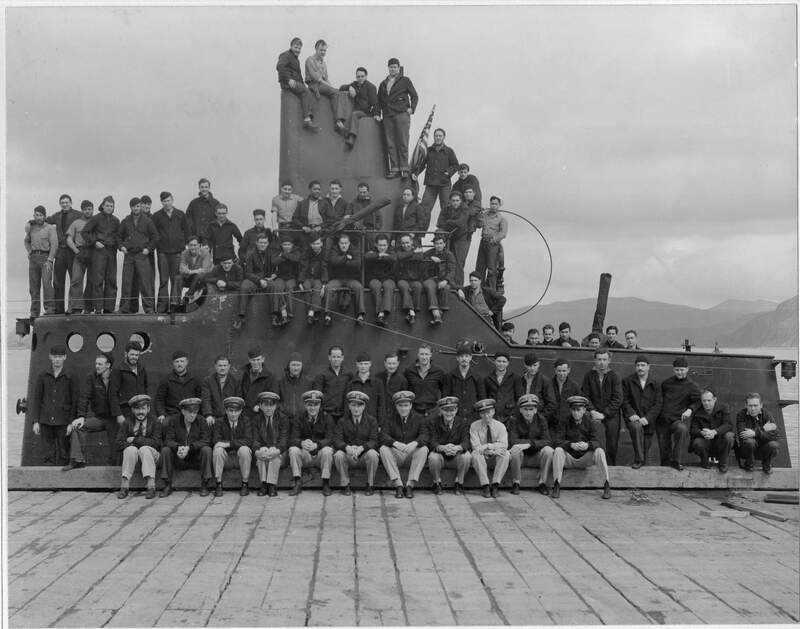 with the entire crew of 59 men while commanding the Shark (SS-174) approximately 11 February 1942. 63k Bathyscaph view of the region where the Grunion (SS-216) made upon impact on her descent to the ocean floor. Photo courtesy of ussgrunion.com.& Bruce Abele. 64k 3D Sounding map showing Grunion (SS-216) spike. Photo courtesy of ussgrunion.com.& Bruce Abele. 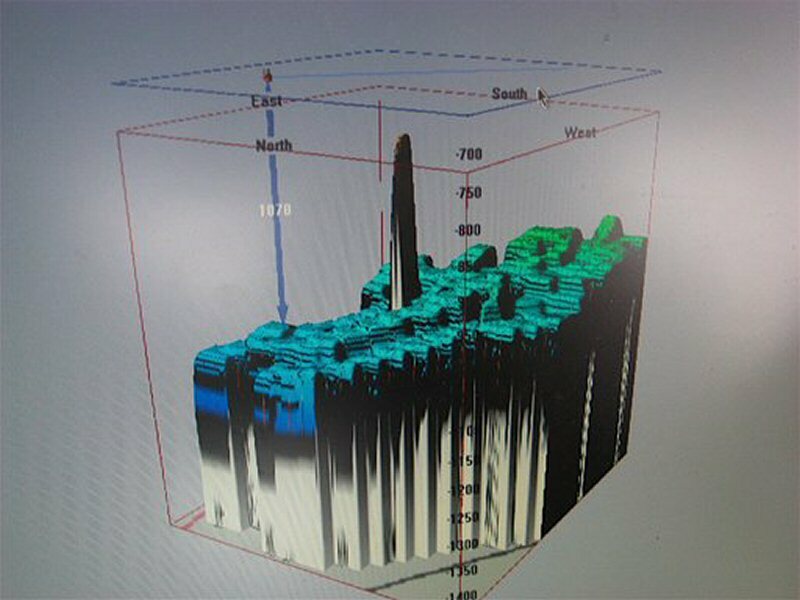 14k Sonar image of a 3000 meter swath which shows the Grunion (SS-216) lying over 2,000 feet down on the bottom of the Barents Sea. Photo & text courtesy of the crew of the Aquila, ussgrunion.com. & Williamson Asscoiates. 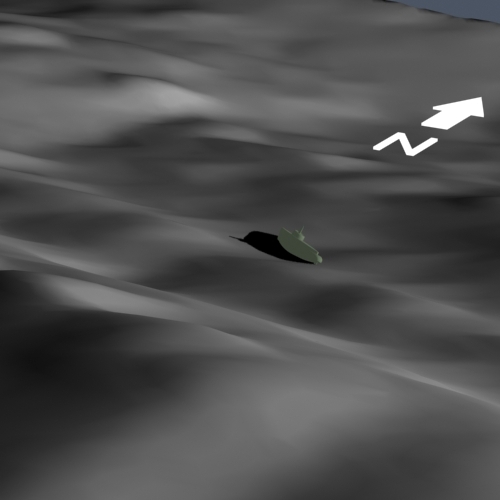 201k Sonar image of a 500m swath which shows Grunion (SS-216) very near centerline of the track lying on her starboard side. You can see the bow and periscope projecting up into the water column. Photo & text courtesy of the crew of the Aquila, ussgrunion.com. & Williamson Asscoiates. 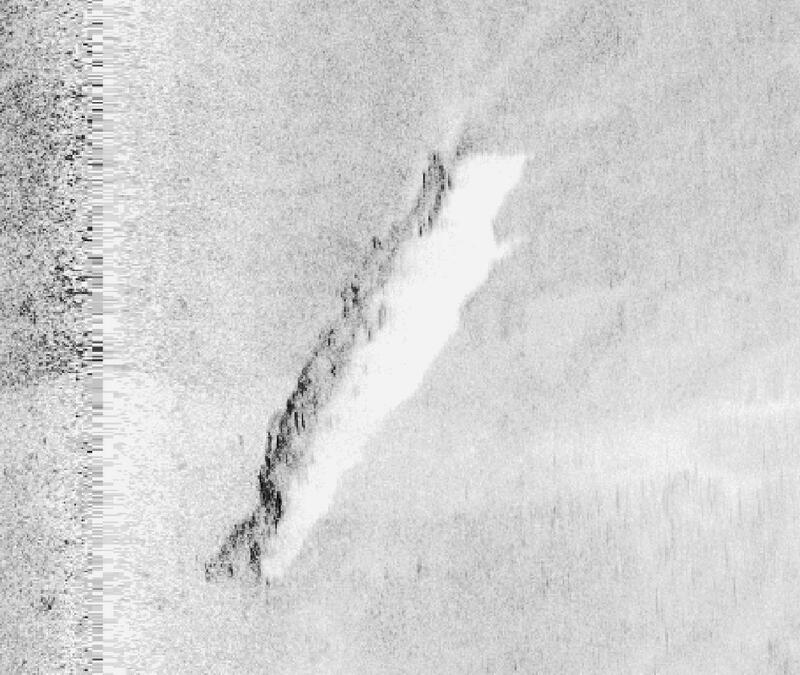 220k Sonar image of a 250 meter swath which shows the Grunion (SS-216) lying on her starboard side at about a 45 degree angle. Photo & text courtesy of the crew of the Aquila, ussgrunion.com. & Williamson Asscoiates. 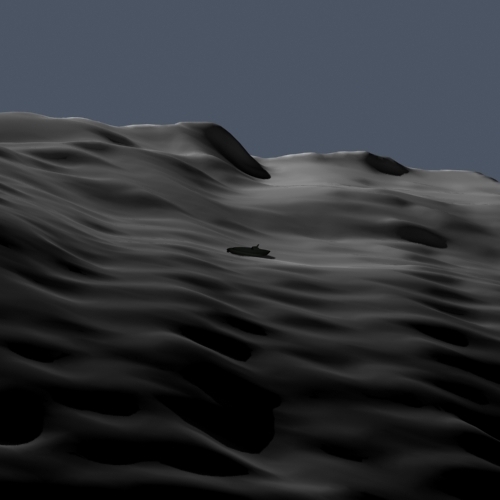 186k Sonar image of a 250 meter swath which shows the Grunion (SS-216) lying on her starboard side at about a 45 degree angle. Photo & text courtesy of the crew of the Aquila, ussgrunion.com. & Williamson Asscoiates. 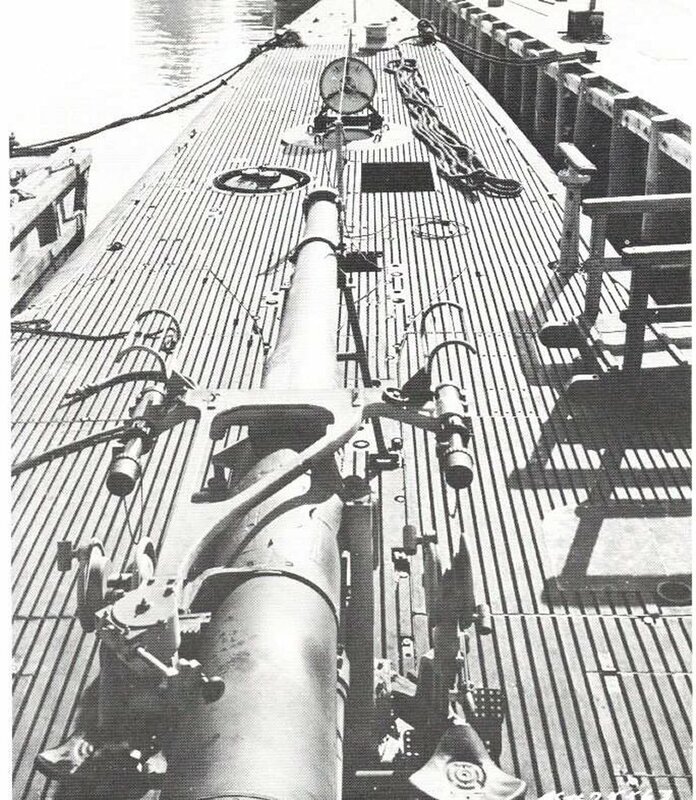 192k Wreckage of the Grunion (SS-216) showing a clean fitting with printing. 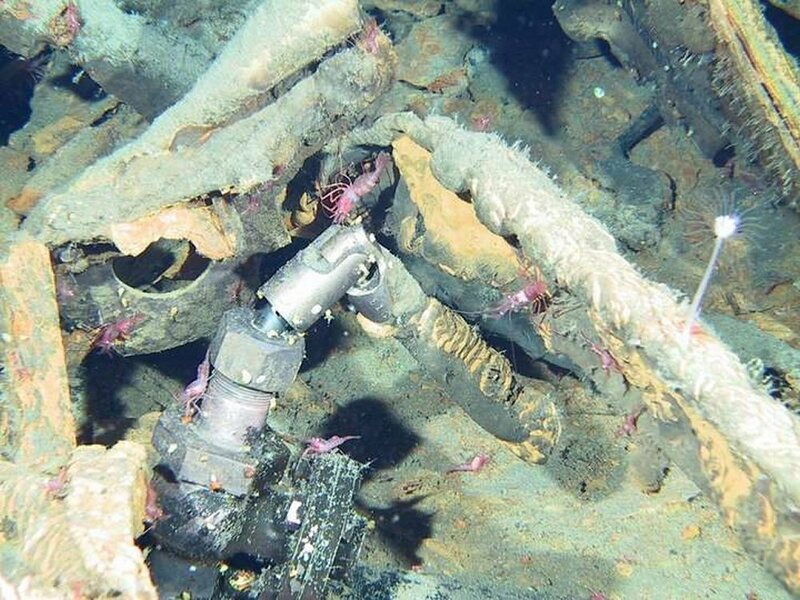 Notice all the marine growth swarming around the remains despite the depth and cold. Photo courtesy of ussgrunion.com.& Bruce Abele. 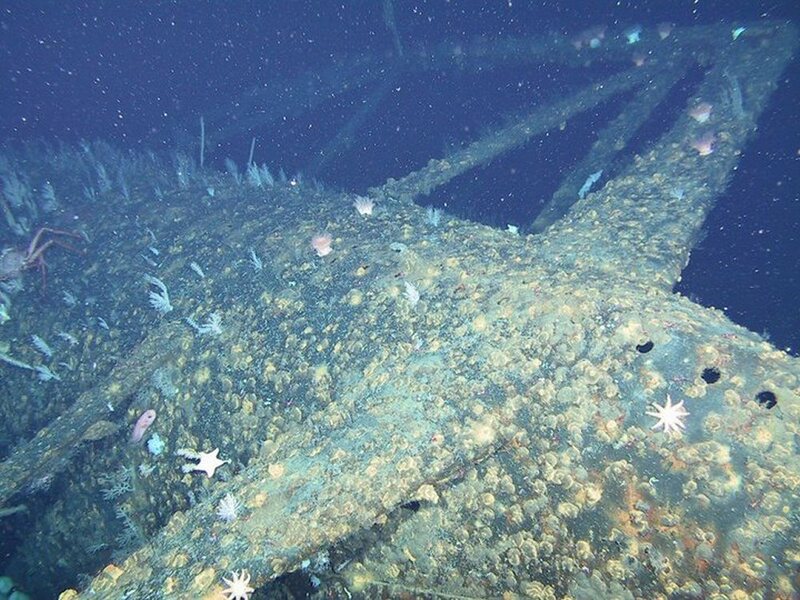 163k Wreckage of the Grunion (SS-216). Photo courtesy of ussgrunion.com.& Bruce Abele. 150k Forward torpedo hatch cover and hatch frame. The deck has been stripped away. Photo courtesy of ussgrunion.com.& Bruce Abele. 116k Open hatch cover of the Grunion (SS-216). Photo courtesy of ussgrunion.com.& Bruce Abele. 96k Grunion's (SS-216) periscope. Photo courtesy of ussgrunion.com.& Bruce Abele. 112k Grunion's (SS-216) propeller guard. Photo courtesy of ussgrunion.com.& Bruce Abele. 120k Grunion's (SS-216) propeller guard. Photo courtesy of ussgrunion.com.& Bruce Abele. 125k Flattened hull just forward of Grunion's (SS-216) prop guards minus her deck. Photo courtesy of ussgrunion.com.& Bruce Abele. 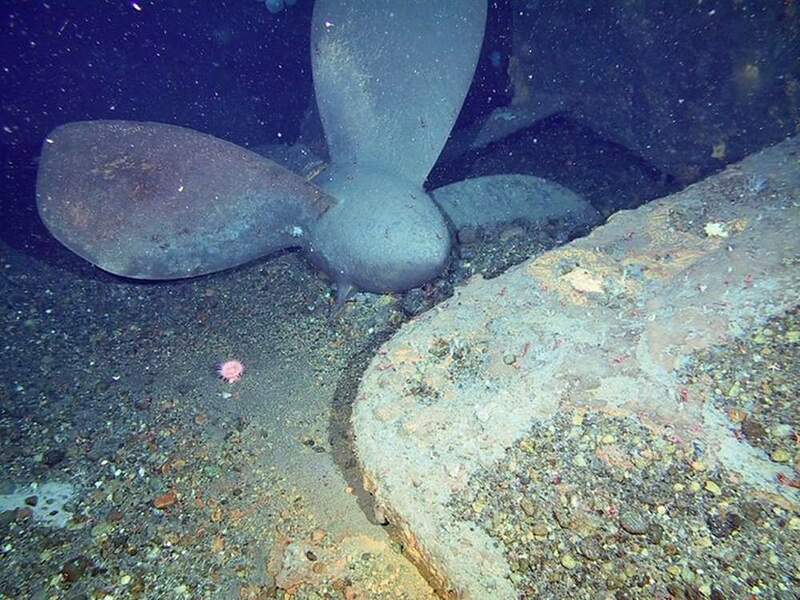 130k Port side propeller and dive plane. Photo courtesy of ussgrunion.com.& Bruce Abele. 71k Range finder. Photo courtesy of ussgrunion.com.& Bruce Abele. 118k Hatch from sail into conning tower. Hatch is bent upwards. Conning tower is slightly collapsed but not imploded like rest of the hull. Photo courtesy of ussgrunion.com.& Bruce Abele. 76k The open starboard hatch. Aft of sail. This hatch leads to the munitions storage. The hatch was not locked down. Photo courtesy of ussgrunion.com.& Bruce Abele. 125k Looking towards the stern at break in the bow. 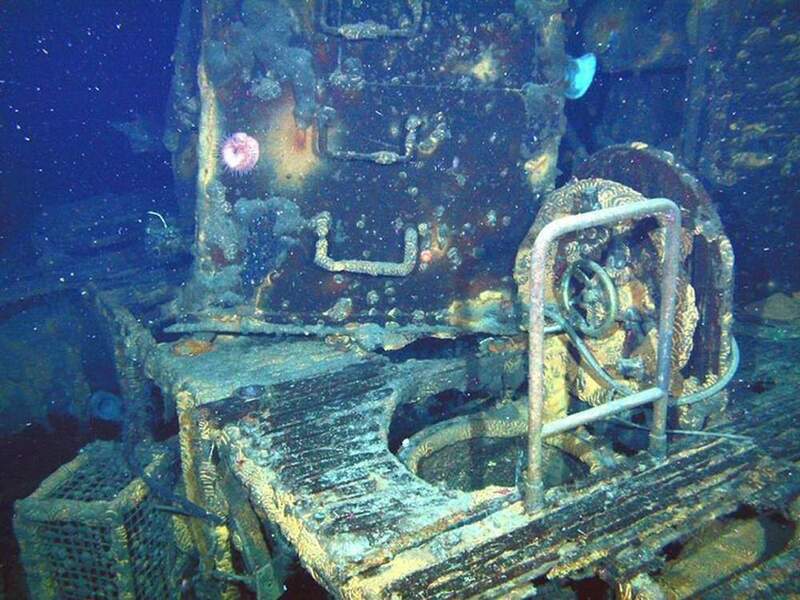 (Forward torpedo room). Photo courtesy of ussgrunion.com.& Bruce Abele. 108k Looking towards the stern at break in the bow. Photo courtesy of ussgrunion.com.& Bruce Abele. 82k Port section of the bow seperation of the Grunion (SS-216) looking aft. 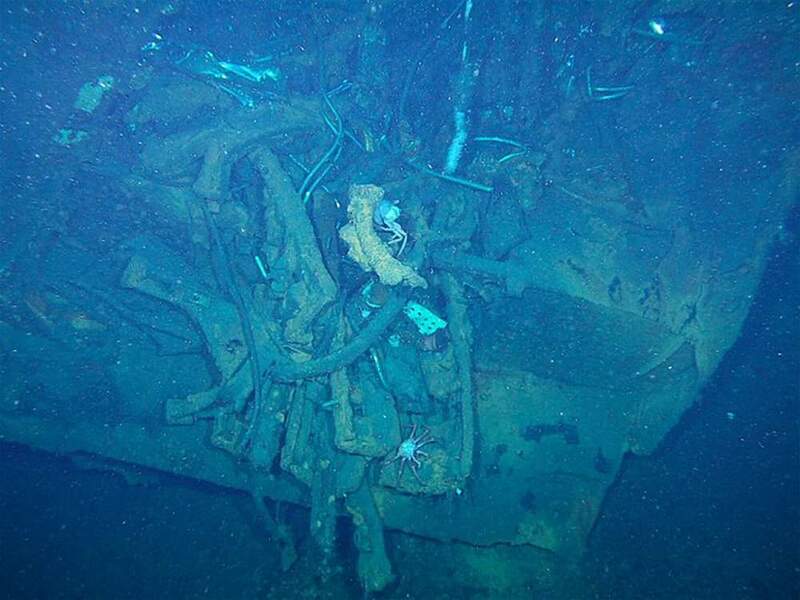 (27 foot section of the bow is missing.) Photo courtesy of ussgrunion.com.& Bruce Abele. 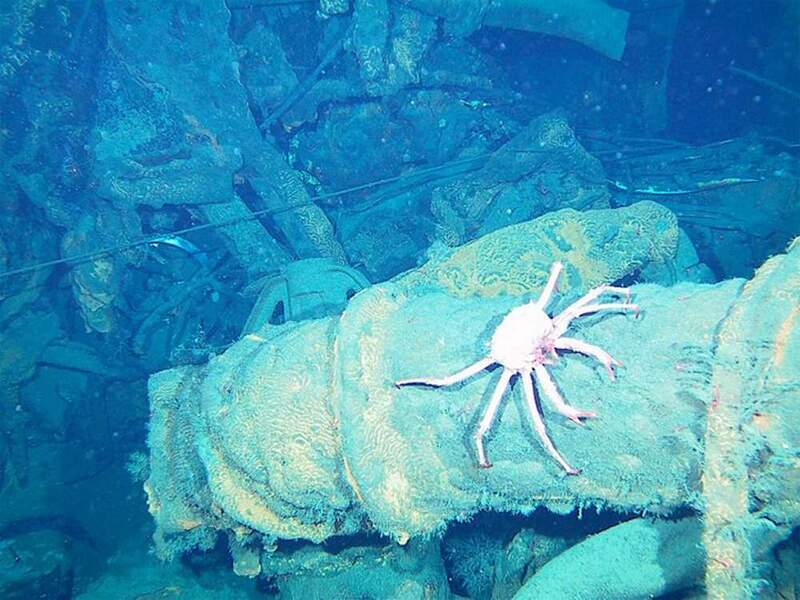 109k Crab on Grunion's (SS-216) main air induction tube (?) Photo courtesy of ussgrunion.com.& Bruce Abele. 28k Antennae fitting aft of periscopes on conning tower. Photo courtesy of ussgrunion.com.& Bruce Abele. The related text here is the fruit of several letters written to this site and Bruce Abele. This is offered as a hypothesis to be tested and not presented as THE ANSWER. 1. Grunion was running on the surface early AM NE of the NE tip of Kiska...close enough to monitor the approaches but far enough out to avoid being surprised by what had been described as "significant ASW activity"...charging batteries and dumping garbage. From this position Grunion would have patrolled to intercept traffic into Kiska. This position would have been just north of the final engagement location above the Japanese symbols about 52N 10' and 177E 50' and she could intercept any traffic into Kiska harbor from any direction as the headland there and MacArthur Reef form a natural funnel. Crewmen dumping garbage had installed the rail along the hatch as it was foggy and dark and they didn't want to get disoriented and lose the hatch. Kano Maru is detected to SE fairly close due to no SJ radar (no antenna on Apr 42 photo) and poor visibility. Quick dive precludes removal of railing. Immediately they go to normal approach course...generally SW depending on relative bearing. Visibility couldn't have been that good looking into the fog and sun in SE (not sure of summer sunrise/sunset that time of year) so probably had little initial data to go on. 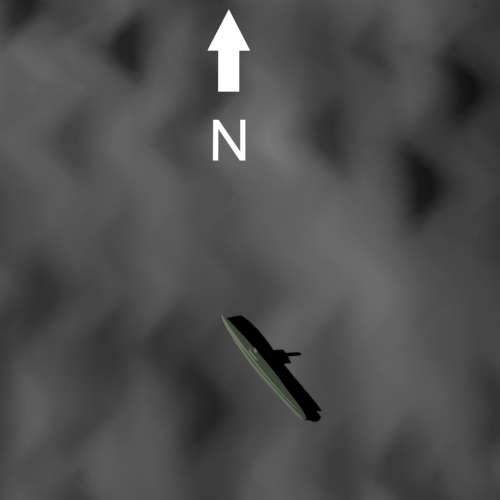 The normal approach course was intended to place the submarine in a position to make an attack regardless of target heading and was used in such cases of limited initial target data. It is basically perpendicular to the bearing to the target. This drives them to a relatively low angle on bow (AOB) before true data can be determined. 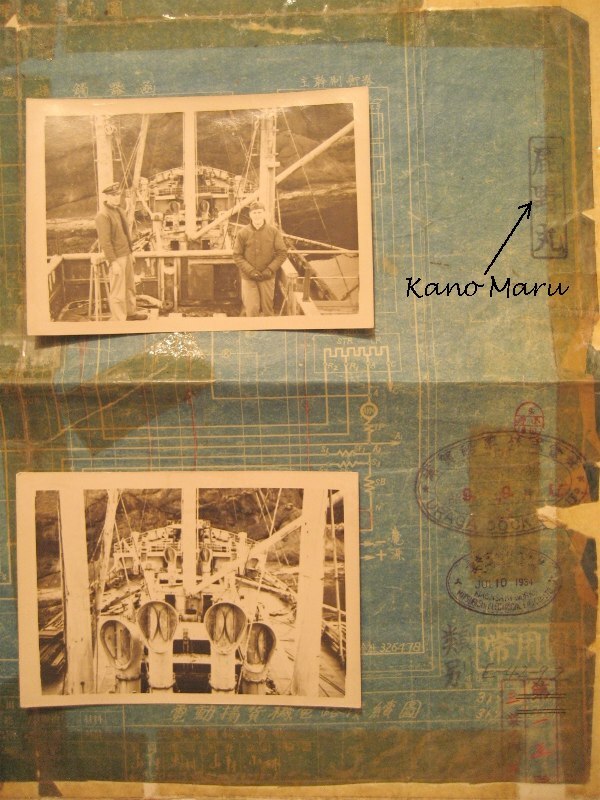 It also may have taken some time to locate Kano Maru in the periscope. Often lookout sightings from high in the shears on the surface were hard to obtain from the periscope 4 feet above the surface. This produced the less than optimum AOB at firing which allowed Kano Maru to turn into and avoid first torpedo (a ~45 degree torpedo track at impact would have been very low, maybe 15 degree starboard AOB or less at firing depending on range). Ten torpedos were all forward per last MSG. 2. Grunion is now very close as Kano Maru goes by. They are concerned about losing her in Kiska harbor/ASW defenses so they do a quick set up, so Grunion had to turn away and set up for another bow shot. 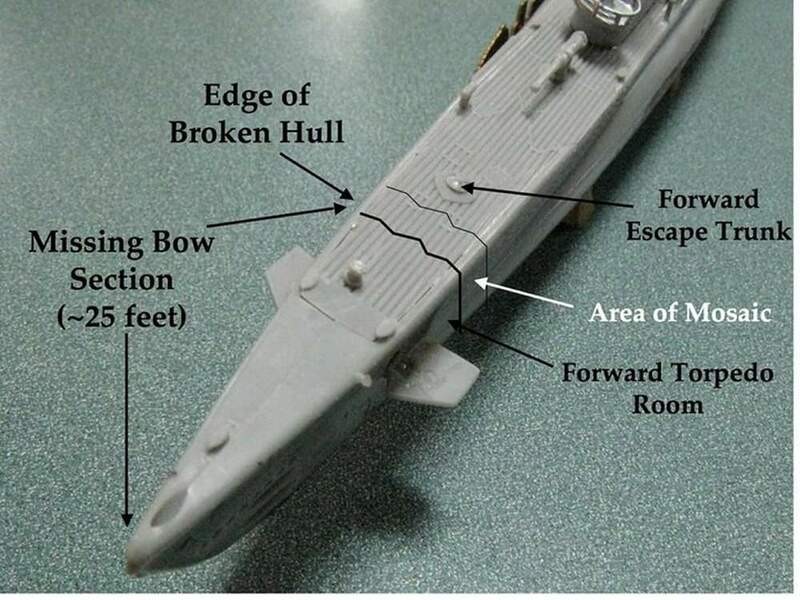 This would take some time as she had to gain sufficient distance for torpedos to arm (> 500 yards) and complete a 180 degree turn to bring bow tubes to bear. Not sure why they fired only one torpedo here. Perhaps due to high AOB the spread would have been very small for multiple torpedos. 3. By now they have figured out the Kano Maru is losing way..."lets take our time... Give me a heading for a beam shot to port at 1000 yards.... we'll make a hole in the other side...help her sink". Heading given is based on current TGT course...but Kano Maru is still swinging (rudder is still hard over even though losing way). Intended to arrive near the Kano Maru's beam, it actually results in AOB 135 port...less than optimum but it will do as target is drifting. There may have been a reload of 3 torpedos during this run. Fire 3 bow torpedos at optimum ~700-1000 yds near zero gyro angle (Kano Maru is drifting, why not give the torpedos the best chance of hitting by lining it up). But with TGT speed of near zero, torpedos have minimal spread. a. 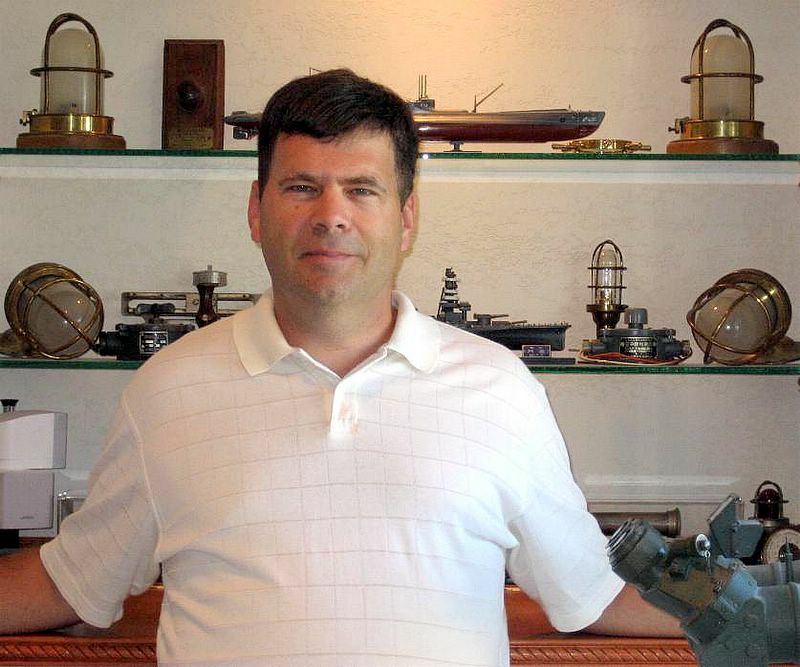 He had nothing better to do than watch and describe what he saw and he is a witness unbiased by preconceived misperceptions about how ships vs submarines operate. His position was closer to the torpedo tracks than Aiura on the Bridge. b. Aiura's account is biased by a surface sailor's view of submarine warfare. Aiura describes a final torpedo attack and turn that are not within submarine doctrine or capability. 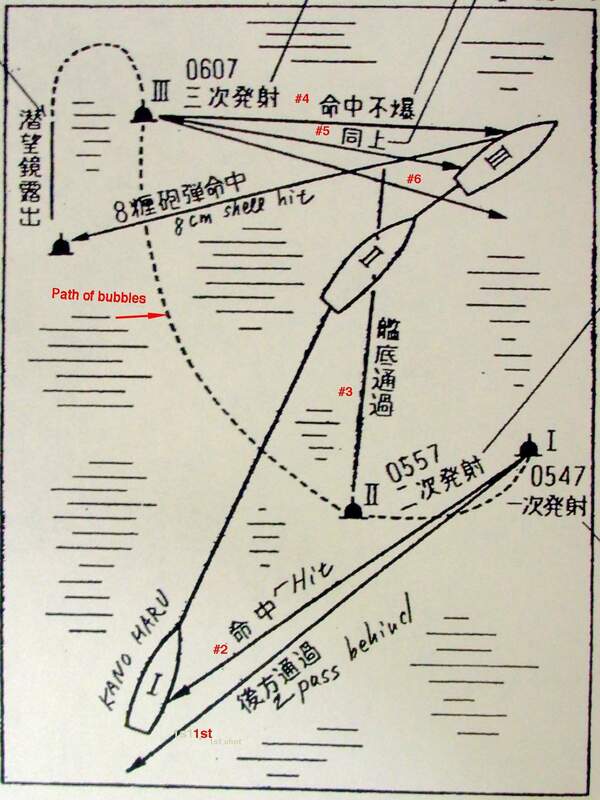 If Grunion started to surface 400 meters away from Kano Maru as described by Aiura after having turned 180 degrees to the left (and assuming at least a 100 meter turn radius...sub's length) that would mean that LCDR Abele fired his torpedoes at about 2-300 yards with a 90 right gyro angle. This is something he surely would not have done. He had more than adequate time to set up the shot as Kano Maru was drifting so there is no reason for him to have executed a shot with high gyro angles well inside min range. c. Aiura was Capt of a ship that had just been torpedoed. He had to have been very busy dealing with conning his ship, dealing with damage control, and trying to summon help from Kiska. I doubt he was standing on the port bridge wing casually observing the engagement for 20 minutes. 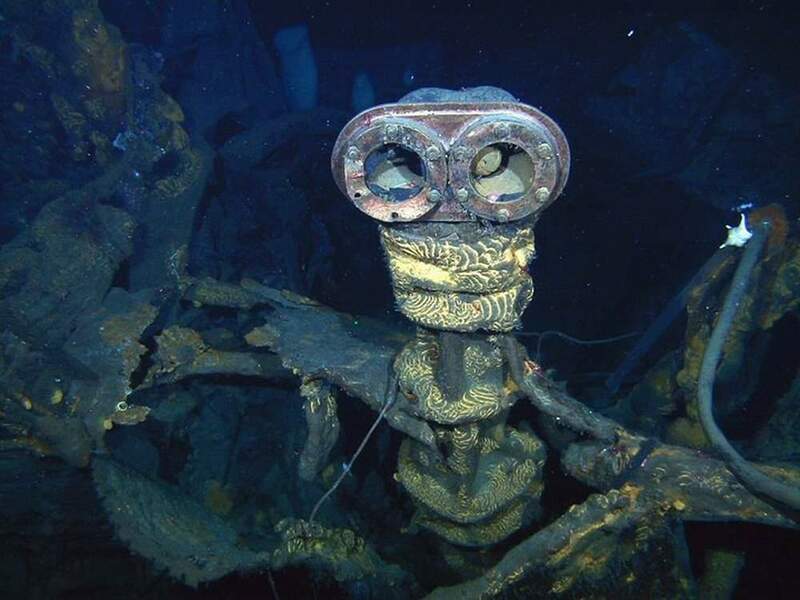 I believe he received reports from lookouts of periscope sightings and torpedo tracks, rushed to the side to see for himself, and then went back to what he was doing when the event was over. Later he connected the dots between these different events to build his diagram of the entire engagement, probably with reference to the ship's log since his times are so distinct. 4. Sound reports circling torpedo tracking to left. 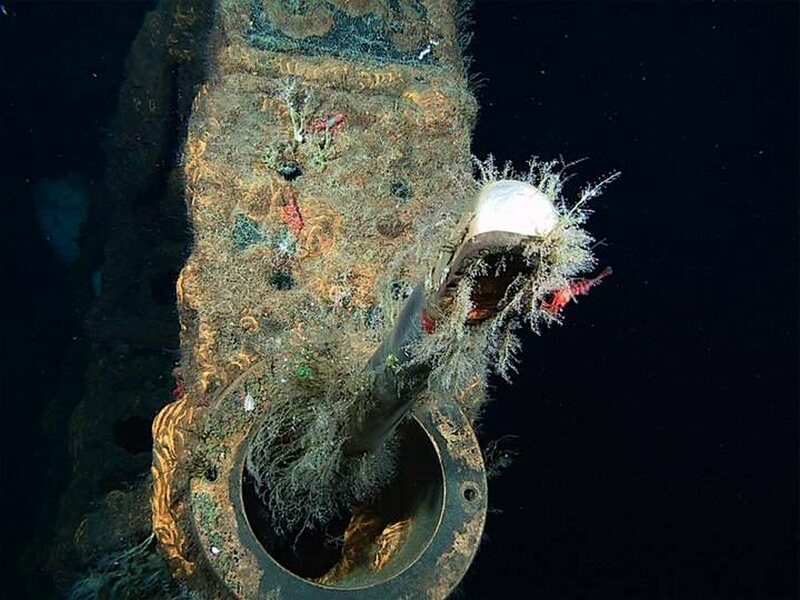 "Right full rudder...all ahead full...up periscope"...looking for torpedo in periscope to try to avoid torpedo (described by Aiura as the long periscope exposure: "the sub kept periscope up and moved calmly ignoring Kano Maru ... then the sub seemed to begin to surface"). This turn would place Grunion on reciprocal course to Kano Maru ~ 400 meters away as Aiura continues to describe: "The conning tower made ripple on the surface and the wave began washing the conning tower". 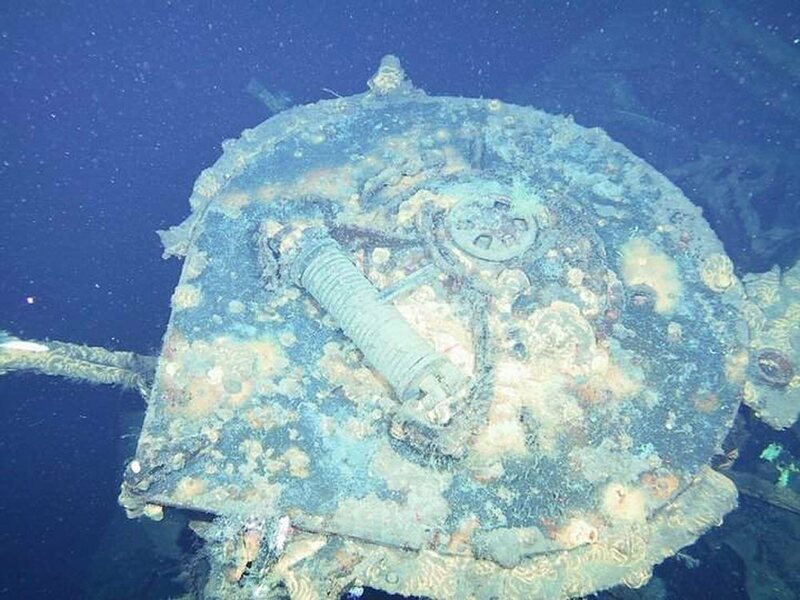 Sounds like a broach caused by diving officer losing trim due to 3-4 torpedos fired and rapid turn and acceleration, which would have been quickly corrected resulting in a return to proper depth (might have been interpreted as sinking if gun hit occurred right then). Aiura says "8 cm shot hit the washing wave, made water column and dull water explosion sound." Does not sound like a surfaced sub to me and apparently the sub sank from view immediately as he next describes "the swell of heavy oil." None of this sounds like a sub surfaced for gun action. I think torpedo hit shortly after the shell hit the water washing the conning tower upper works. 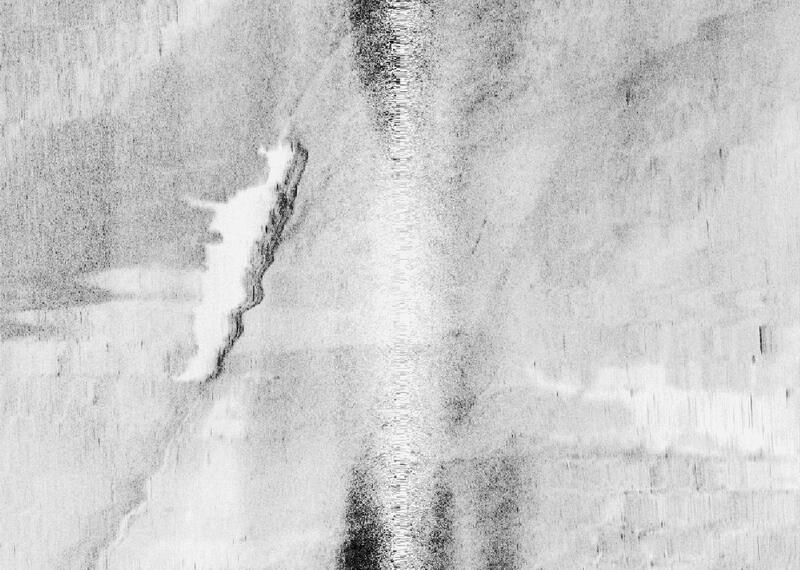 As the torpedo hit the port side of the bow just FWD of FWD escape trunk (Port side of bow seems to be ripped and bent inwards; starboard side is a clean break mashed inwards by what appears to be impact with the bottom) the explosion occuring so soon after the shell hit and the submergence of the sub convinces Aiura and other Japanese they sunk the sub. It is also possible the magnetic exploder actually worked without having to impact in this case...wouldn't that be ironic after two duds. In any case, if it did hit, it would have been a high impact angle which did not tend to break the exploder firing pin so this one did not dud. 5. The explosion blows the ("bow") to starboard; ripping the metal on the port side and swinging like a gate along the seam on the starboard side, breaking it off & leaving the clean break we see on starboard side. This also accounts for the holes in the hull on the port side aft of the break while starboard is not holed. 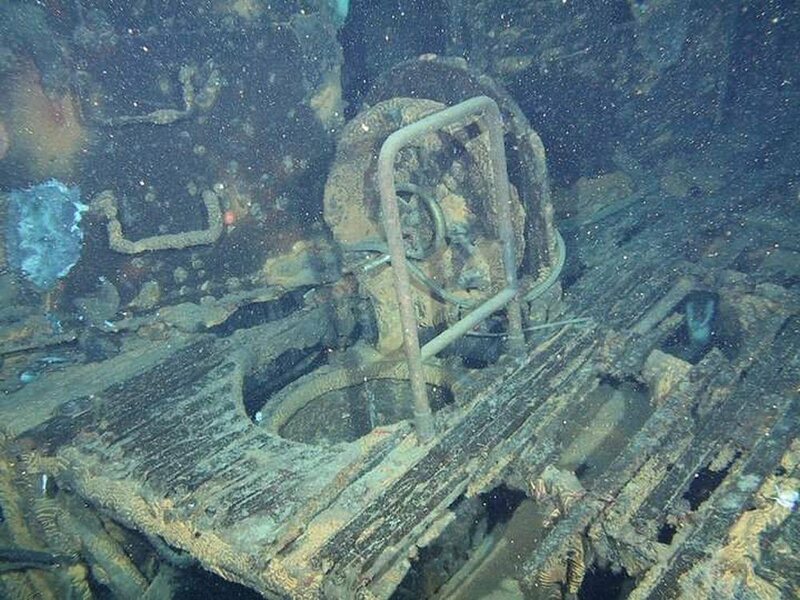 This also blows much of the decking off far enough back to release the marker buoy and at least 2 of remaining torpedos forward have their warheads blown off as they are liberated from FTP room and float to surface to be found 500 meters aft of Kano Maru, (all torpedo skids are damaged and bent and no torpedos remain in the wreck FWD). Sub immediately takes large angle down by bow due to lost buoyancy FWD and stern planes set to counteract the broach. Diving officer orders full rise on the planes but bow planes are gone...angle gets worse and, still at full speed ahead, speed builds up rapidly. 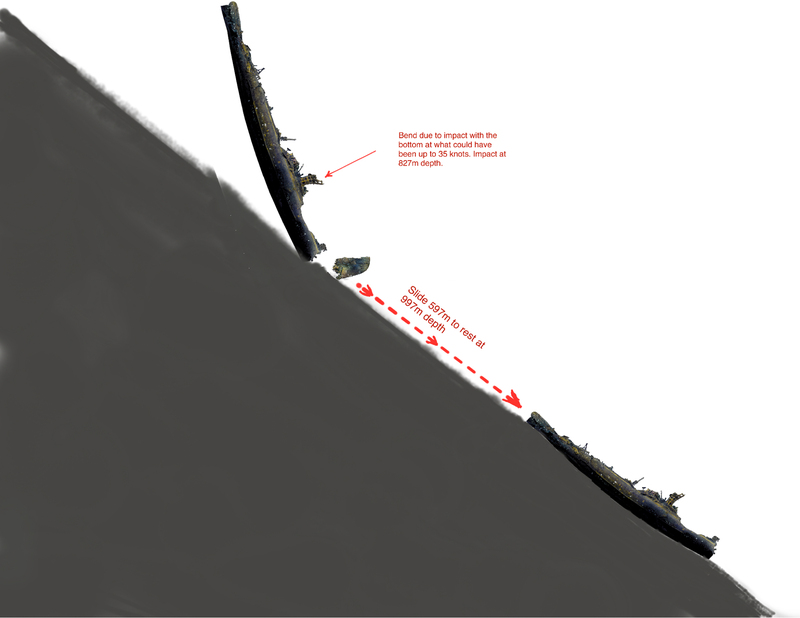 Water flow between remaining deck forward and pressure hull forces decking upwards and away taking FWD portion of fairwater with it smoothly parting along forward edge of "covered wagon" supports going up and away over the top of periscopes. "All back full" might have come next but too late to stop plunge. 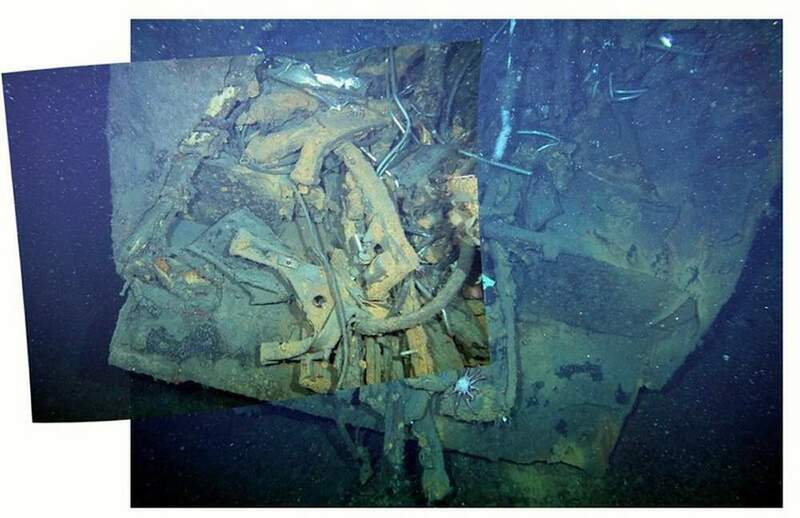 Some ballast blow certainly would have been ordered also but ballast tanks forward were probably compromised by explosion and depth was probably building up too much pressure to overcome. Crush depth would have come quickly. 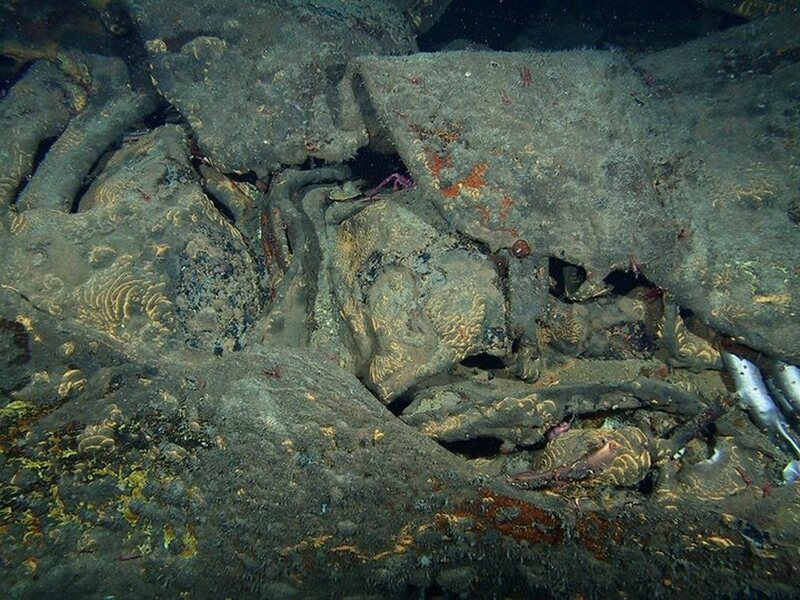 At crush depth the compartments start to implode along the top centerline at the weak spot of the pressure hull. By the way...the gun is not trained upwards, it has fallen fwd down into the imploded hull giving the appearance of being pointed upwards. 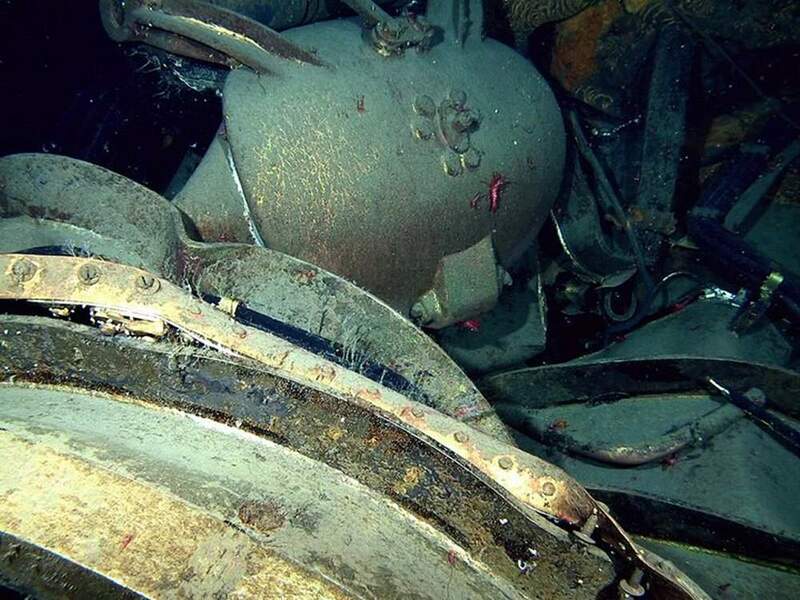 As After battery compartment implodes the pressure spike goes up the crews' mess hatch and blows it open unseating the hatch gasket which flows out but catches on the hatch wheel and loops around the hatch cover when sub hits bottom. Conning tower is crushed inwards until hatch seal breaks allowing water to rush in and equalize pressure. 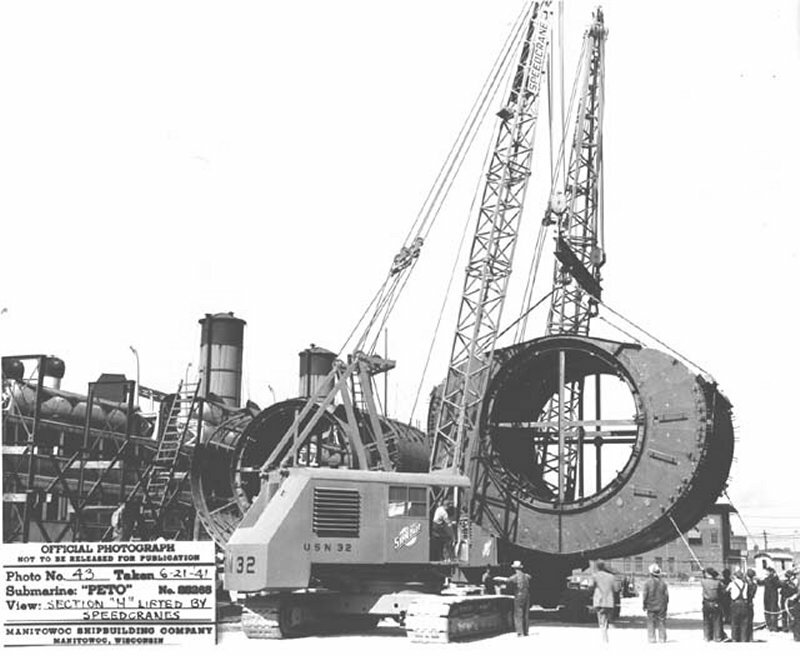 The conning tower is not fully imploded because, as it deformed, the hatch bent breaking the seal and equalizing the pressure. I have annotated the diagram here to show the part of the sub that is missing in red hatching. You can see the forward ends of main ballast tank #1 in the pictures of the broken off bow. 6. Now traveling very fast and steep, the sub hits the bottom mostly on starboard portion of bow that protrudes farther than port (and sub may have been rolled a little to starboard at impact) crushing in the right side of the bow break causing the necking we see. Sudden deceleration bends what remains of periscope shears and covered wagon structure forward. Also collapses aft part of upper fairwater sides and tips gun towards the bow and down into the implosion break making it appear to point skyward. 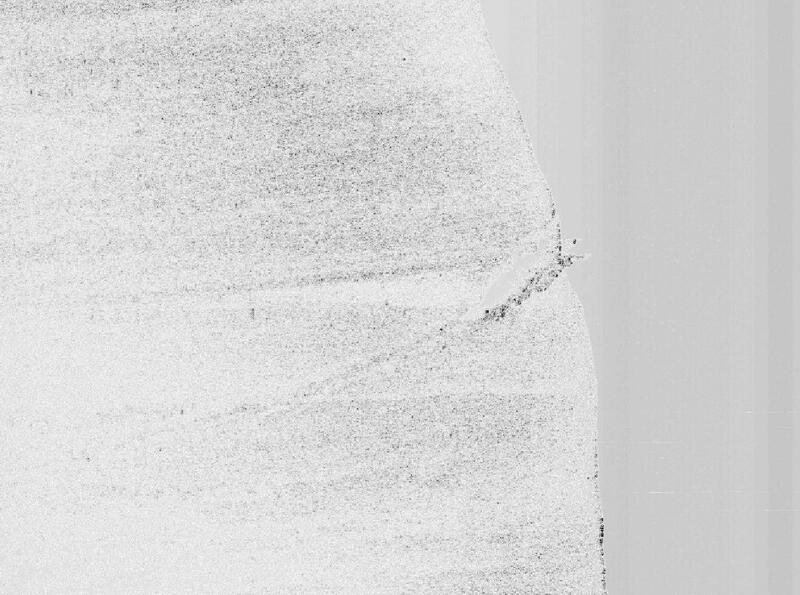 Compression fracture occurs half way between bow and conning tower (this break appears to be compression in nature followed by separation as the stern came down). Stern bangs down bending rudder and the slide begins. Some of the other cracks could be implosion related, or impact as the stern came down. 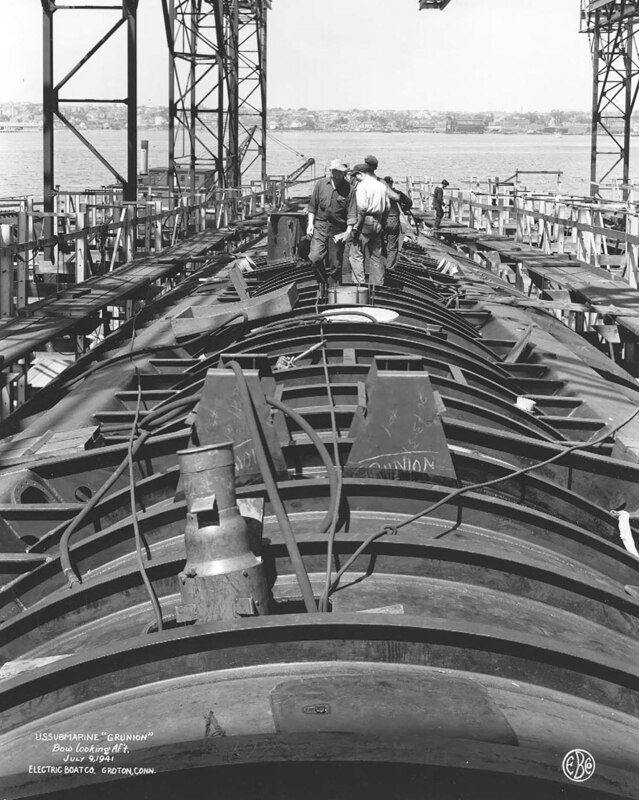 This picture illustrates the construction of the central portions of the Grunion where ballast and/or fuel tanks surround the sides and bottom providing for a weak spot along the spine where the hull would implode causing the caved-in appearance of the wreck. This picture illustrates the construction and location of the conning tower and covered wagon structure over it. 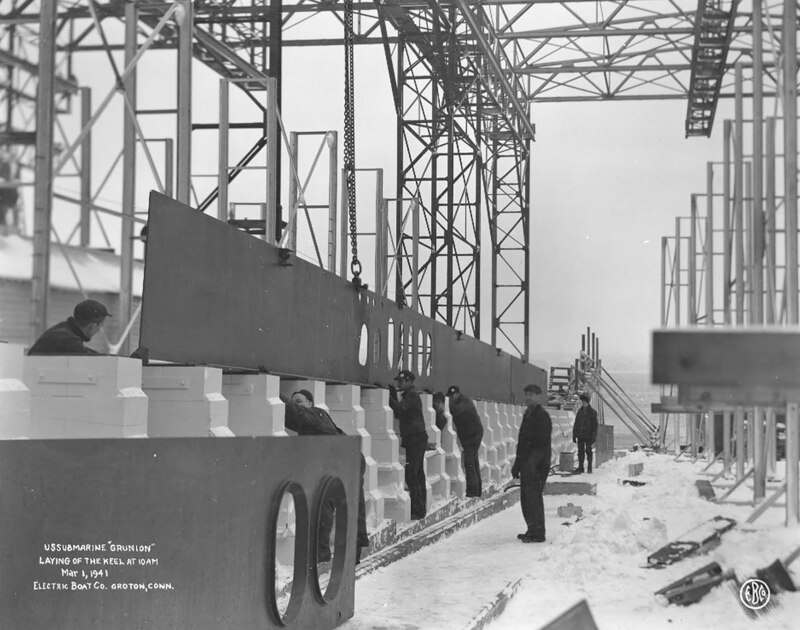 The conning tower and the frame of the covered wagon is installed on the Pompon SS-(267). Here is Finback's fairwater before it was cut down. This is what Grunion looked like. All the structure forward of the red lines is gone on the wreck smoothly parted from the front of the covered wagon structure. 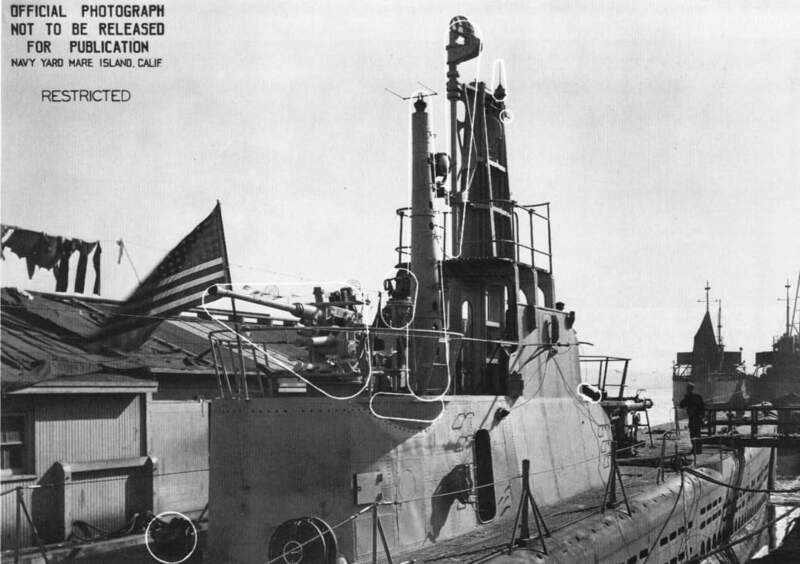 This picture of the Gato shows the FWD escape trunk hatch and the marker buoy (still installed in this 1944 photo). The bow is missing from this hatch forward. All the decking is gone FWD. Grunion's gun was not in this position, it was aft. Photo & text courtesy of John Hart. 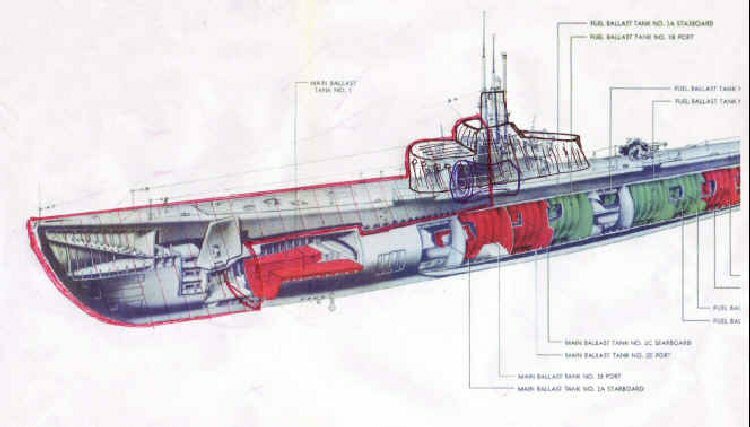 67k Sketch by Jim Christley of the Grunion's (SS-216) wreck. 1. The general shape and size of the bow portion that is missing. 2. The forward bulkhead of the Forward Battery. I noticed that structural failure in this area took with it the structure in and around the torpedo loading hatch. 3. A major structural break which may have been caused by impact with the bottom. 4. The conning tower barrel with the reachrod type mechanisms for the helm. In later boats this was replaced by hydraulics, but the Grunion used electric planes and helm control. 5. A �debris' or torn tankage area that deserves further study. I believe this is in way of a fuel tank and may point toward shell damage to the tank and possibly some internal piping. 6. Lines that indicate the the size of the pressure hull over the engine rooms. 7. A major hull break in way of the After Engine Room after bulkhead. Photo courtesy of ussgrunion.com. 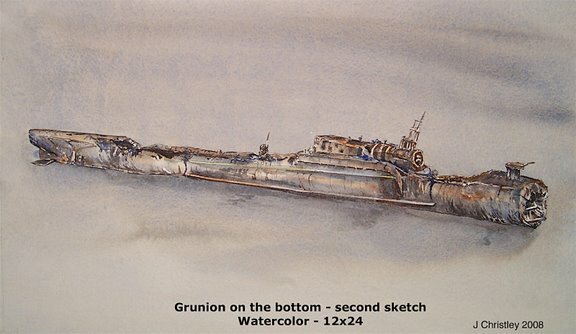 2.18k Sketch by Jim Christley of the Grunion's (SS-216) wreck. The following PDF was produced by Christley, Galler & Thompson and represents a number of points to consider. Photo courtesy of ussgrunion.com. Insert PDF "No Longer Hidden" courtesy of Bruce Abele. 567k This painting is offered as a hypothesis and not presented as THE ANSWER. 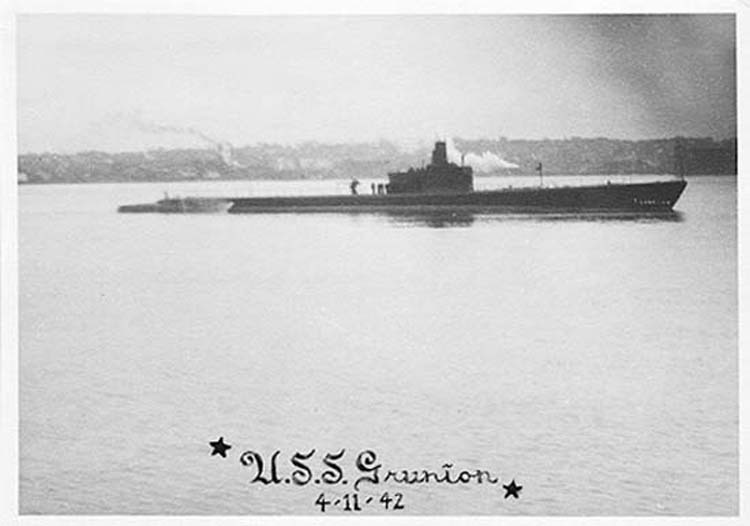 Grunion's (SS-216) last dive. Drawing courtesy of Ben Kennedy.